After completing a trip, I find it helpful to reflect on what worked, what broke, what I enjoyed more and less. 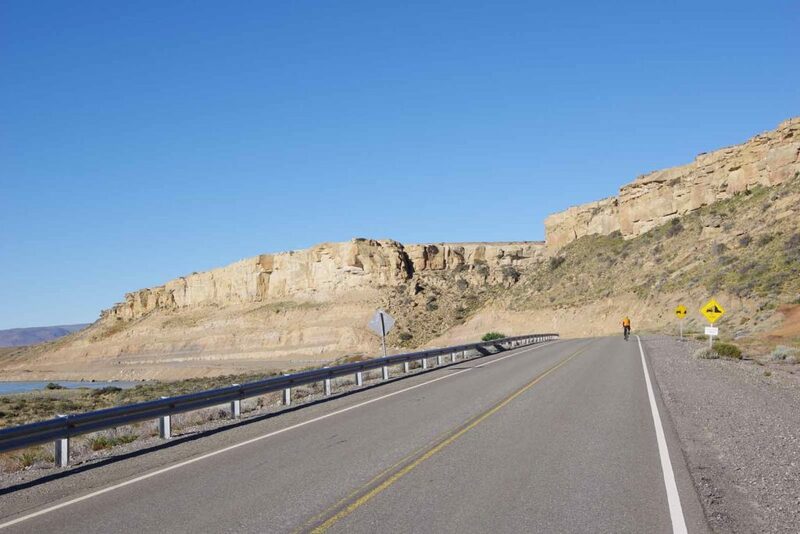 I believe there are many different ways to do bicycle touring – and not one single “right” method – but instead a set of preferences and things that work differently for different people. However, also write this down if it might help others thinking of a similar trip. On previous long trips, I often bought a new bicycle, especially for the trip. In contrast for this ride, I decided to take four of my existing bikes prepped as necessary: two Trek 4500 mountain bikes (one of them I cycled across Africa) and two Trek 520 mountain bikes (one of them I cycled across Europe and Asia). This gave me both a primary bike and a spare of each type. I cycled most of the way to Banff on my touring bike and after that the rest of the trip on my mountain bike. None of these bikes are particularly fancy or expensive, but I updated to get stronger wheels and a leather saddle. I also put a front rack on my mountain bike. Disc brakes: I have become a big fan of disc brakes – mainly because of a failure I didn’t have. As a rider who is both heavier than average and cautious, I wear through brakes. On previous trips, this also eventually meant a failure on the rear rim. This didn’t happen on my trip. I replaced rotors once and brake pads many times, but didn’t have any rim failures. Hubs/Wheels: I had two hub failures, both with a Phil Woods hub and the pawls sticking down and the hub spinning freely in both directions. After that, I had Sugar Wheel Works build up a different wheel around a DT Swiss 540 tandem hub. I took an extra ratchet mechanism and grease with me, but the hubs worked without a problem. In my experience, while Phil Woods makes a strong hub, it seems like also important to get the mechanism opened, serviced and cleaned and that is difficult for me to do on the road. After four Phil Woods failures, two prior to this trip and two on this trip, I am more shy about using them on other trips. Through the failures, I was pleased with service I had from Sugar Wheelworks. Frame: The right chainstay of my aluminum Trek 4500 bicycle was cracked in Bariloche and welded. There is sometimes a debate about the suitability of Aluminum vs. Steel on touring bikes. Despite the failure, I am still undecided on the debate. Derailleur: My rear derailleur twisted off the bike in the mud of the Dalton Highway. For now, I still think of this as a fluke that happened once in many cycling miles. Tires: I used three different models of tires during the trip: Schwalbe Marathon Plus, Schwalbe Marathon Mondial, and Schwalbe Marathon Supreme. The first two are heavier but also extremely durable tires that served me well. The Supreme tires are considerably lighter (and hence faster). They held up well enough, though I did eventually have enough punctures that I ended up picking new tires back from the USA. Once I got past Mexico, I didn’t see Schwalbe tires in bike shops I passed along the way. They might be there if one searches more. Tubes and tire sizes: Through Latin America, I had 26″ wheels but with Presta tubes and not the more common Schraeder valve. There is also a debate in cycling community about 26″ vs. 700C in Latin America. I carried enough spare tubes and in my experience, the odd sizes I had were not an issue. Overall, I thought the bikes served me well enough from a reliability and durability angle. Some choices made for a slightly slower ride on my mountain bike. That wasn’t a big deal when I was self-supported touring and was a minor factor in the group riding. I found myself saying this statement a few times, partially in answer to conversations I had including what I enjoyed most. Also, as a reminder to myself that on the TDA trip to focus on that ride (going on a TDA ride focused on all the ways it isn’t same as self-supported touring is a setup to be unhappy). On the TDA supported ride, one has support with cooked meals, your gear carried and security of a medic and bike mechanic along the way. The food was excellent, not just my opinion but also of other riders. On the TDA supported ride, one has social interactions of traveling with a group of riders. 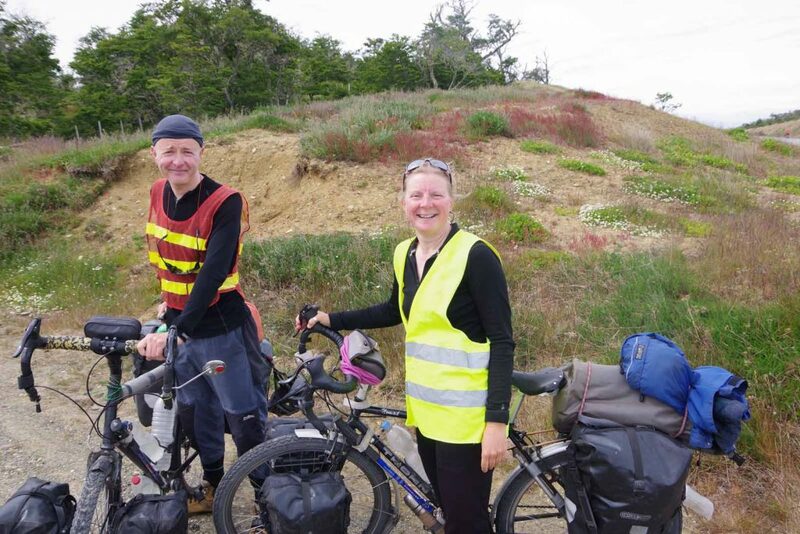 For example, it was interesting when we met solo supported cyclists along the way, they seemed eager to talk with us as other cyclists. The TDA ride essentially has a fixed agenda and fixed route. 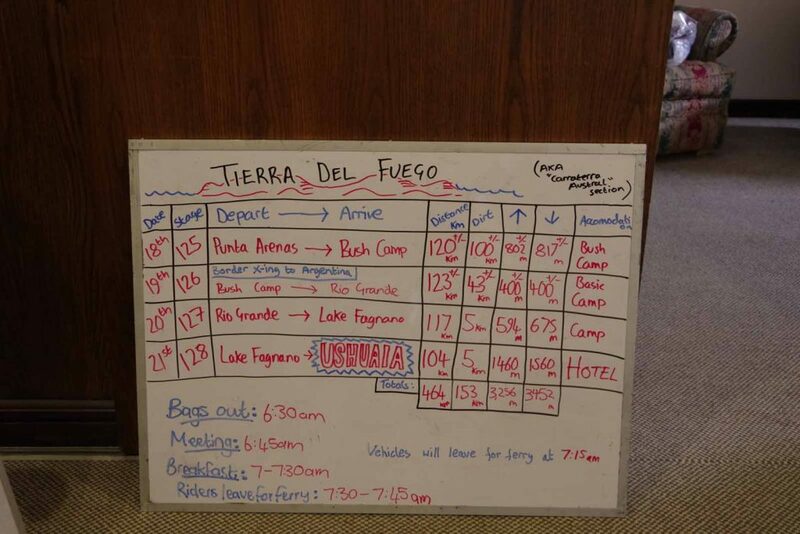 Each riding day one checks a whiteboard, copies down the route instructions. 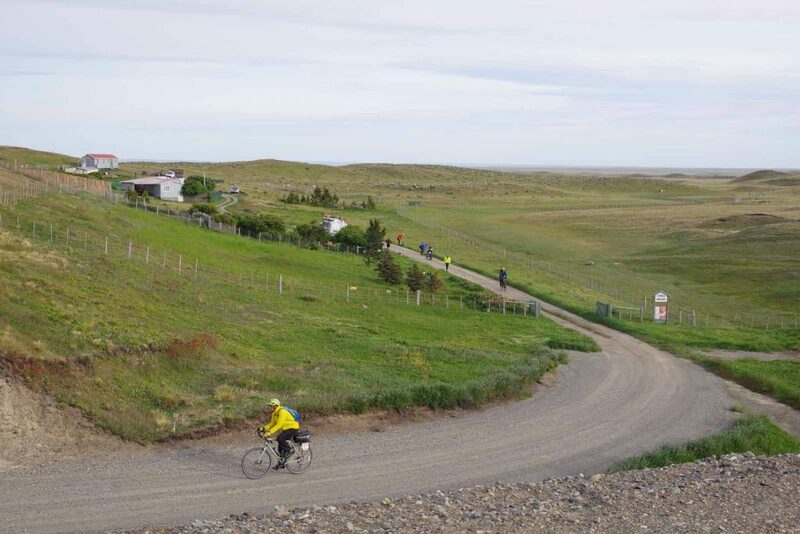 During the day, riders go at their own pace and stop when/where you want, but generally follows route instructions or “flagging tape” to figure out where to go. On my self-supported riding, I would adjust my distances and routes as I went along and also take rest days when it made sense for me. The alternatives to cycling the daily TDA route and distances are essentially to be on the bus or other transport. 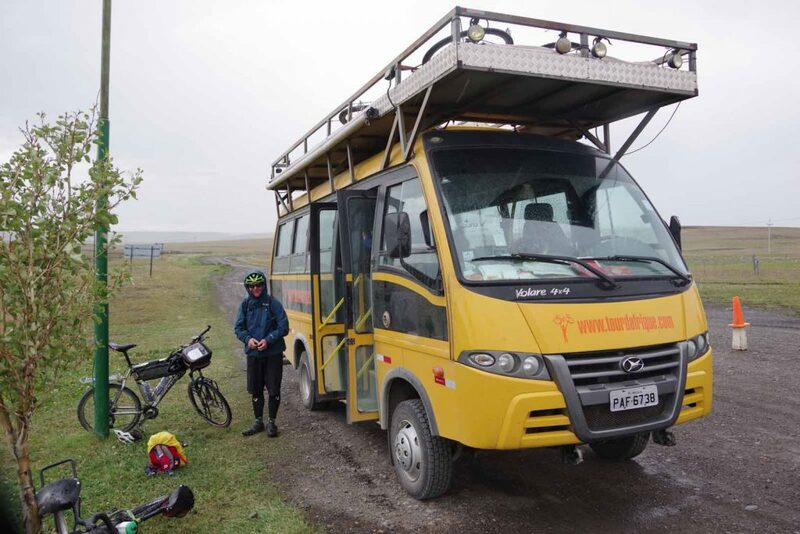 After cycling every inch from Cartagena to Puerto Montt, I had some long days of gravel riding where I ended up on the bus. 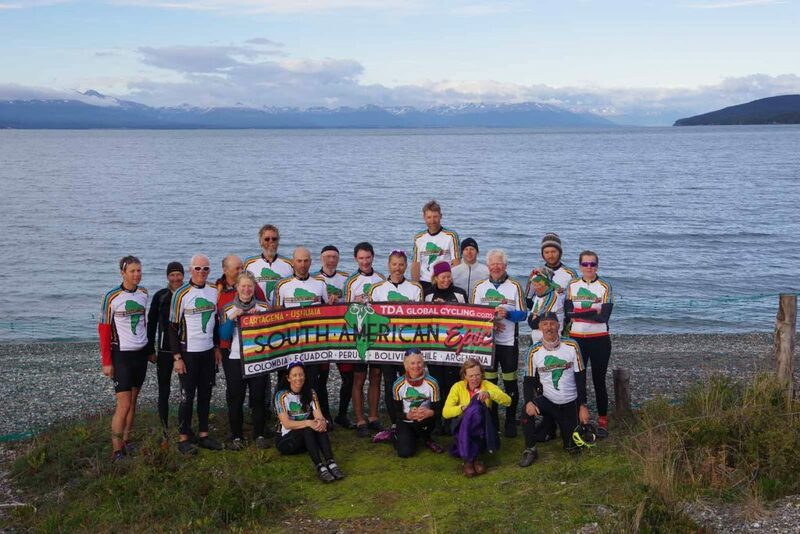 Overall, I planned my trip for 2016/2017 to give myself an option of riding with TDA through some/all of South America and ended up exercising the option to do the last month with TDA from Puerto Montt to Ushuaia. 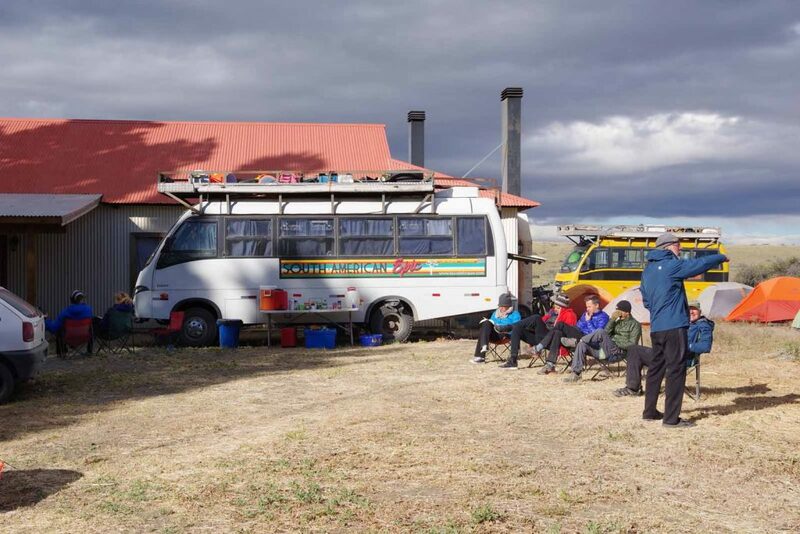 This gave me a fixed end date for completing the trip and support through some difficult parts of the Careterra Austral as well as some of the most remote parts of South America. In hindsight, I think this was the right choice. 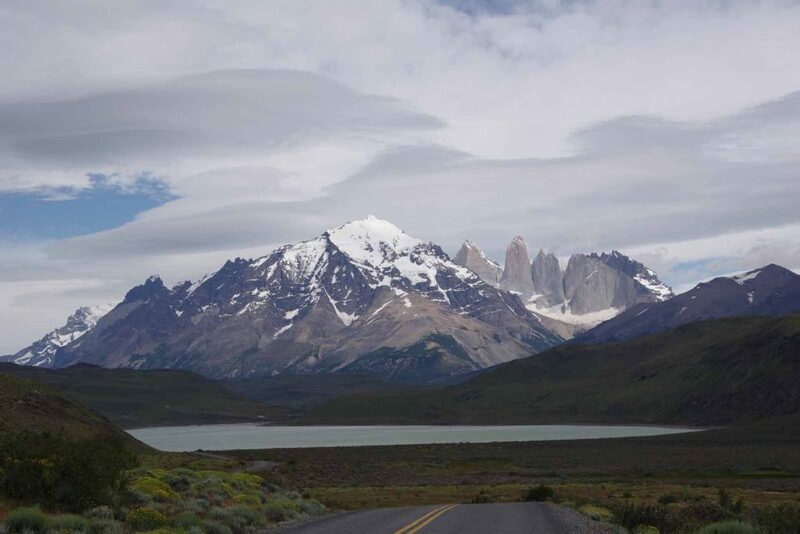 While I could have cycled on my own for this last section, I would have chosen to ride via the Argentinian side and also would not have taken the extra time for hiking at El Chalten or Torres del Paine. 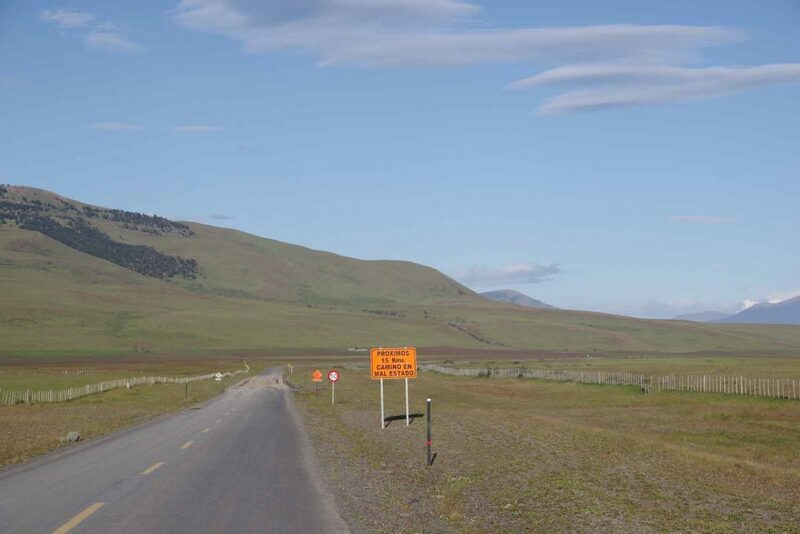 I would have also missed the interesting border crossing at O’Higgins. 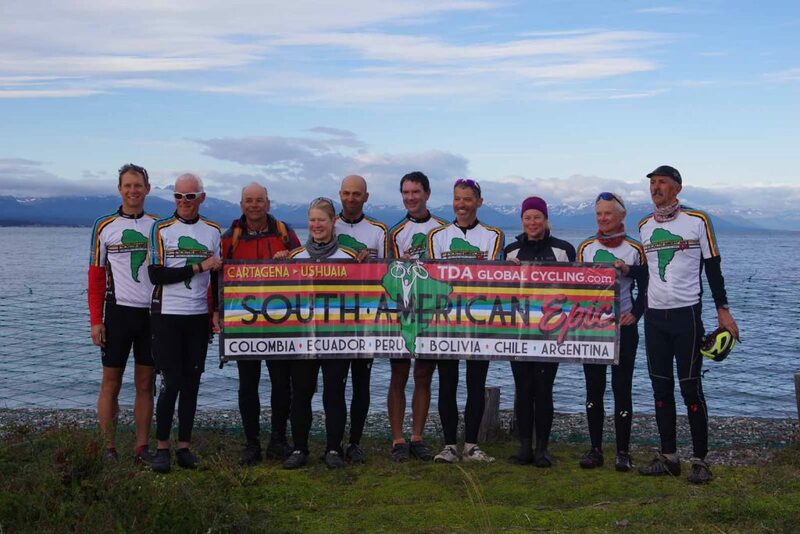 I’ve now cycled with TDA three times: once through China, once across Africa and once in South America. Given the tradeoffs above, I don’t expect to ever be a TDA customer for their tours in “tamer” parts of the world, e.g. North America, Europe or Oceania, and I’ll prefer touring self-supported on my own. However, in those places where language/geography/weather make things more extreme, I’ll choose TDA for a supported ride again. Tent: My REI Quarterdome tent served me well enough. It started new. There are some holes in the floor and also now one in the rainfly. 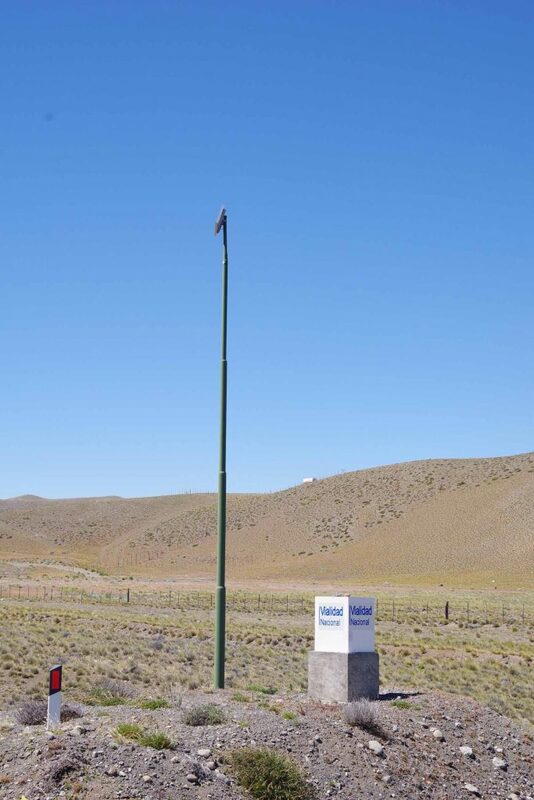 One of the poles is slightly bent. One zipper is starting to stick. It held up well enough in the wind and other weather. Hence, it is starting to get “worn out” but will be fine for more local trips. Sleeping Bag: My sleeping bag was rated for -8C/17F. Except for a few nights in Peru/Bolivia, this was warm enough for the trip. I had many days of temperatures just below 0C, but only a handful in the -15C to -5C range. I had a second light sleeping bag for the Altiplano region of Bolivia and Peru and was warm enough. For most of Mexico, Central America and coastal Columbia, it was much warmer even at night. Thermarest: My thermarest developed a hole in it from camping with thorns in Baja California. I was able to patch some of the leak, but it still was slow enough to deflate halfway through the night. Cycle Computer: My Garmin cycle computer worked through the trip. The rechargeable batteries run down after a day of riding, so found an extra battery pack helpful. I stayed in hotels often enough that other charging e.g. dynamo or solar wasn’t necessary. Worn out: The following things wore out during the trip: one pair cycling gloves, two handle bar bags, one broken pannier, one Camelbak. I also lost: two cycle mirrors, one little thermometer. Trailer: Originally I didn’t have a front rack on my mountain bike, but did have an Extrawheel Trailer. I somehow misordered and discovered I was missing the hitch and then later purchased a front rack. I think that was a blessing in disguise as having front rack ended up worked better than I expect the trailer would have. Overall, other equipment held up well enough along the way. 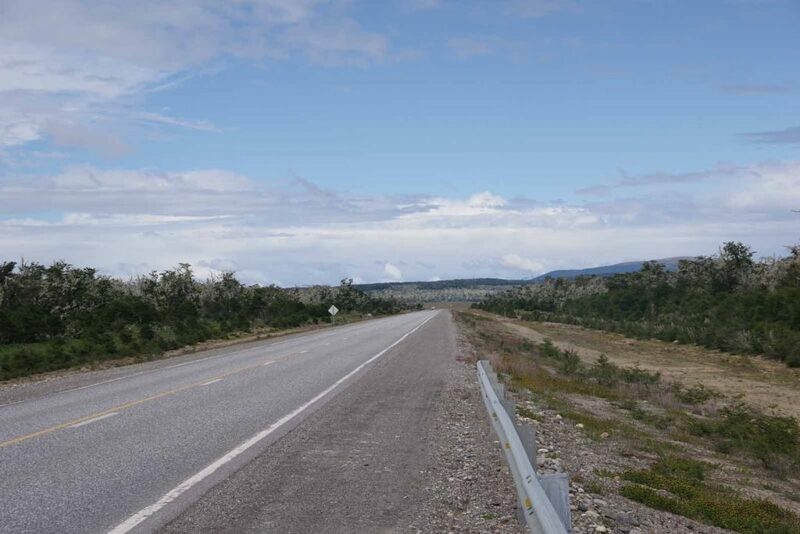 Cassiar Highway vs. Alaska Highway: In 1997 I had cycled the Alaska Highway all the way to the end. This trip, I cut off on the Cassiar instead. I enjoyed the choice and found the Cassiar was still more “rugged”. 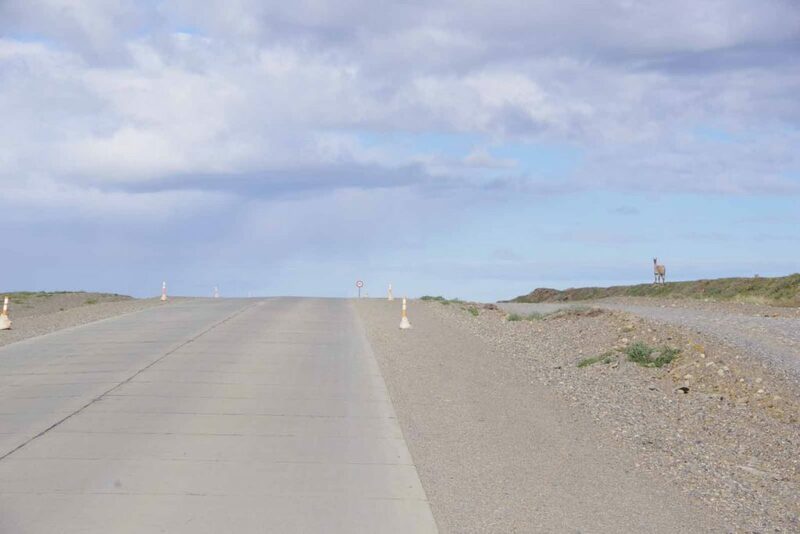 The cleared areas on both sides of the highway is less, the short grades occasionally steeper and I saw more wildlife in this part of the Cassiar than I did previously on the Alaska Highway. Icefields Parkway: The Icefields Parkway was stunning and a highlight of the trip. It also ended up being crowded enough that I needed to make reservations in advance for camping and hostel sites. I’m glad I made the choice to ride this section rather than going back via US Pacific Coast. The Pacific Coast is also nice, but I’ve cycled most of it three times before. Great Divide Route vs. Paved roads: I cycled just some parts of the GDMBR before riding most of the distance on the paved highways going through the same areas. I expect this is one of those personal preference things where some prefer the more rugged/wilderness aspects of a wilderness road and other prefer better road quality/small towns of a busier highway. I am more in the latter camp. I enjoyed the parts of GDMBR I cycled, but overall am at least as happy on paved roads. Baja California: I enjoyed Baja. I had picked Baja as a “gentle introduction to Mexico” and found the riding not difficult. There is only one highway and in a few sections, the road is narrow with not quite enough room for two trucks to pass along with a bicycle. There is also a moderate amount of traffic. However, I enjoyed the overall desert terrain and occasional small Mexican village. It also was easy cycling that helped my confidence in starting Latin America. 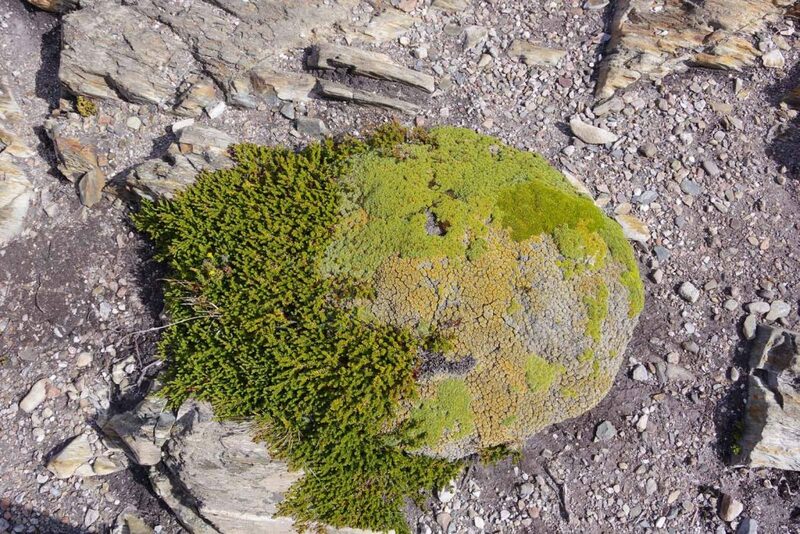 Highlands of Mexico: Elevation matters. Even in December/January, the lower coastal areas of Mexico were surprisingly hot. I’m glad I was able to ride through highland areas where it was significantly cooler. Toll roads vs. Free roads: I crossed a good portion of Mexico on the toll roads (cuota) rather than the other (libre) roads. Some of this choice was for better roads including shoulders and somewhere the travel advisories suggested they might be safer. This worked well enough for me. However, I now also have additional confidence that I might make more of a mix of both roads types on a future trip. Highlands in Guatemala and Honduras: Elevation matters. As in Mexico, traveling at higher elevations is cooler cycling at expense of having more hills to cross. I would make the same choice in the future. Pan American through Panama: A good portion of my cycling though Panama was on the major highway. The road was good and there usually were good shoulders. However, traveling a busy highway through an area that was fairly hot was not a highlight of the trip and I might look for other alternatives on a future ride. Cartagena/Medellin/Popayan/Pasto: I took the major road via the west in Colombia. Overall, I enjoyed this route and Colombia as a whole was one of my favorite countries. 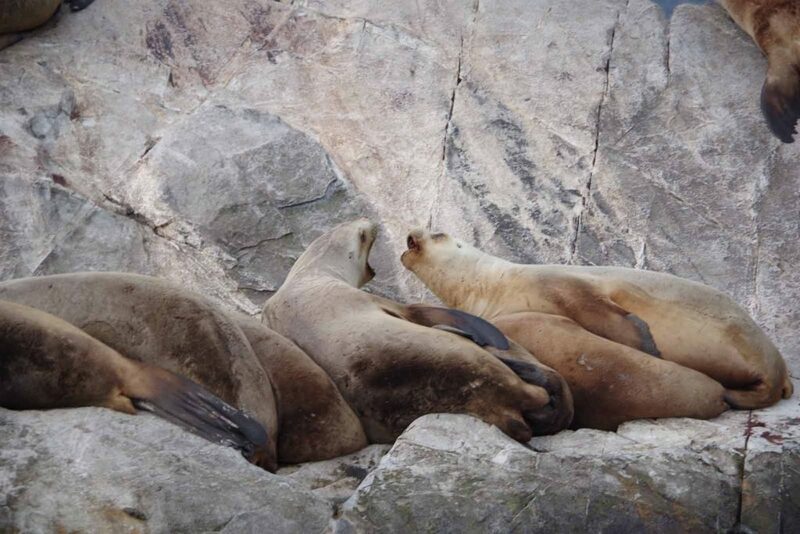 Coast of Peru: I cycled more than 2000km along the coast of Peru. 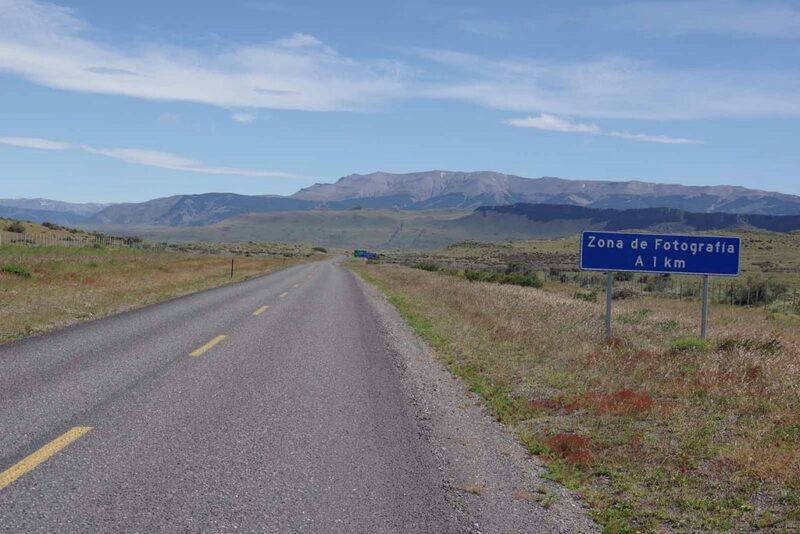 There is a definite tradeoff in Peru between the coastal areas which are flat and the highland areas with poorer roads, many more hills smaller towns. Average distances in the mountains would be significantly lower than along the coast. The coast was surprisingly cool with the Humbolt Current creating temperatures rarely below 12C or above 20C. Further south it also brought headwinds. While not the most exciting part of my trip, it was an expedient route that I would do again if I were crossing all of Peru. 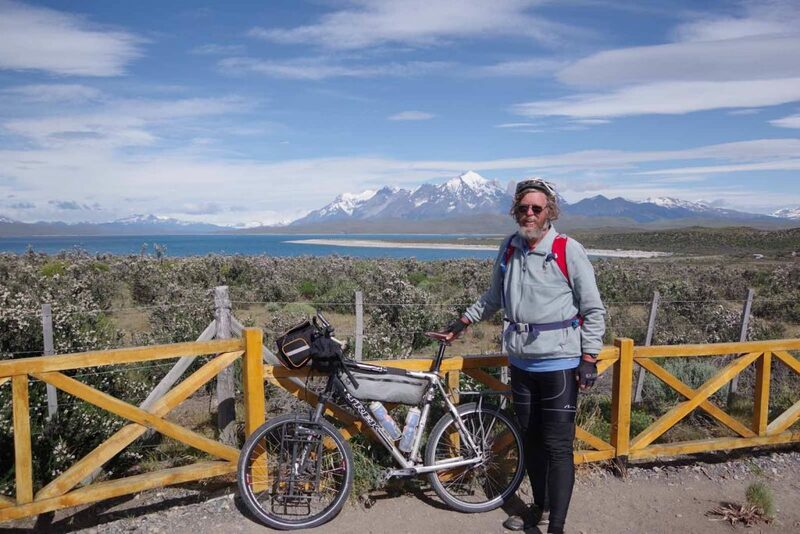 Lake Titicaca, Bolivia, Altiplano, Salar: While I could have kept going south into Chile, I really enjoyed my time cycling up at the higher elevations. Lake Titicaca beautiful and going via the salt flats was a highlight of the trip. 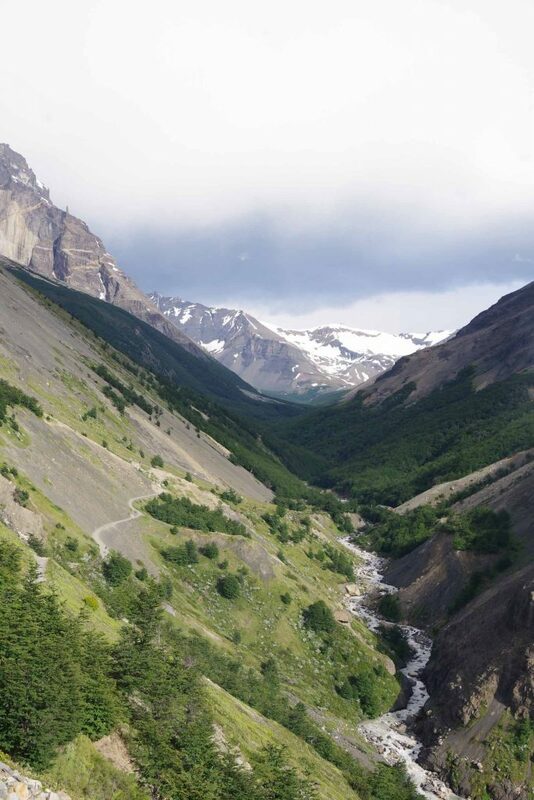 Argentina vs. Chile, particularly south of Mendoza: My perception is that the tradeoff is that Argentina is drier and windier while Chile may not be as windy but a lot wetter. 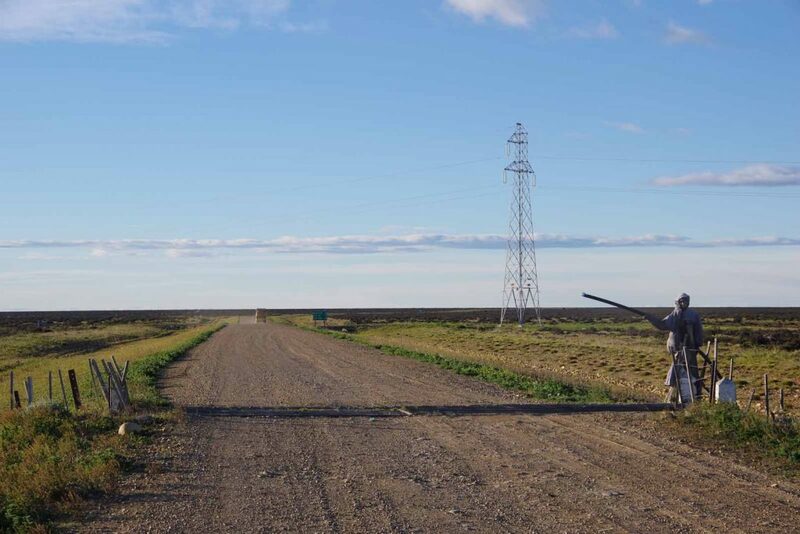 As a whole, I found the riding via Ruta 40 to be interesting and enjoyable. 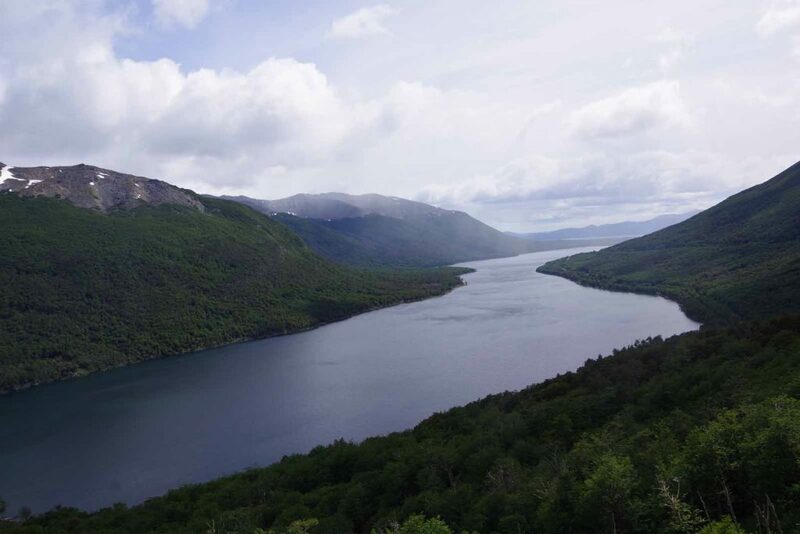 Once I got close to Bariloche, it became rather beautiful as well. Careterra Austral: Already covered in the TDA section above, but I also found the Careterra Austral to be a highlight for the ride. Overall, I followed relatively common routes mostly along the Pacific Coast of South America and other places there wasn’t as much choice. Spanish: I had enough “survival Spanish” to do the trip, but found extra times I spent in Oaxaca and Bariloche to also be valuable. More Spanish generally helped my interactions with locals and further conversations than the immediate purchase or hotel stay. 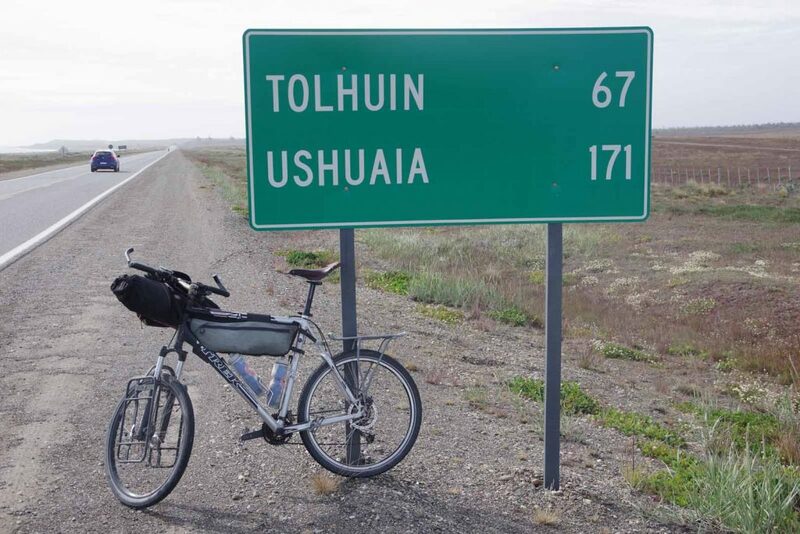 This trip is my sixth long bicycle ride and completes rides across six continents. Some might inevitably ask, “which was your favorite” or why. My general response and advice is generally twofold: (a) my recommendation is always to “do your own country first”, e.g. Americans cycle across the USA, Canadians across Canada, Europeans through Europe, etc. The reason is one has extra connections to people, history, and language. Hence, my first ride across the USA (in 1992) was also special. (b) if I have to pick, I’d probably select time in Australia. 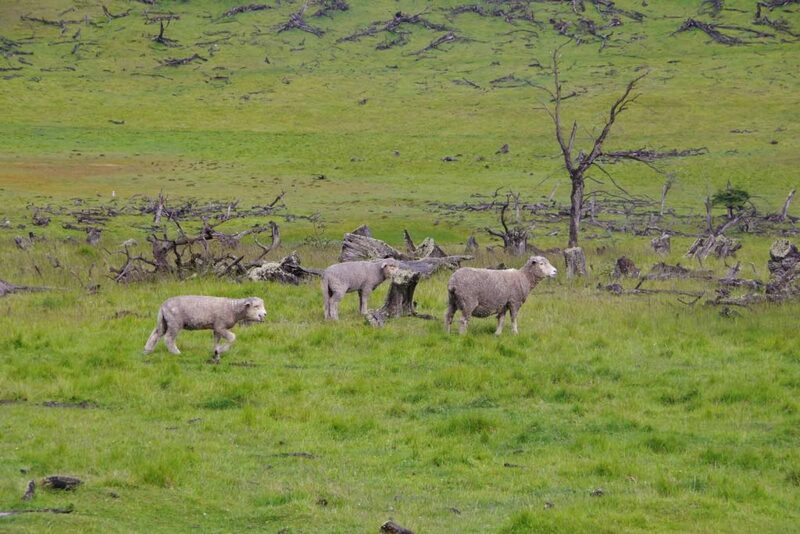 I really enjoyed the outback areas and being in country long enough to get a feel and sense. English-speaking made travels a bit easier as well. With that said, I really enjoyed me cycling these past 18 months through Canada, USA and then Latin America. There has been an interesting phasing of regions and variety going from country to country. I also like the “newness” of seeing a different part of the world and found travels in this Spanish-speaking area to be relatively easy. Not sure what or where my next trips might take me, but I’ve seen enough of Latin America that I’d love riding through the areas again. Are there questions or reflections that I’ve missed or you are curious. Let me know via “comments” or “contact” above and I’ll add to this post over time as well. Overall, I really enjoyed my ride and I am happy and grateful I was able to do it. I would make many of the same choices if I were to do the same trip again. One might also ask, “what next” and for the first time in a while I don’t have another cross-continent multi-month trip already in my plans/dreams. I’m sure I’ll keep doing other shorter rides and tours along the way. I had some relaxing time after the ride to see Ushuaia. 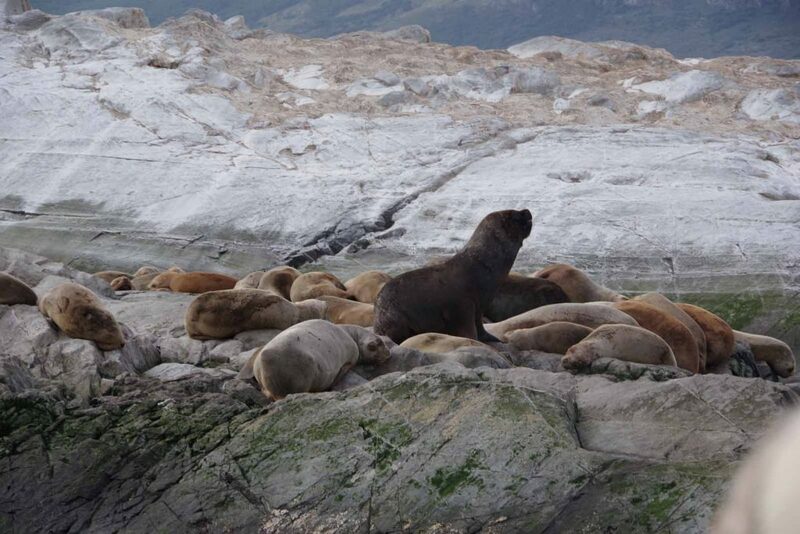 I wandered through downtown tourist areas and also took a four-hour boat tour on the Beagle Channel. 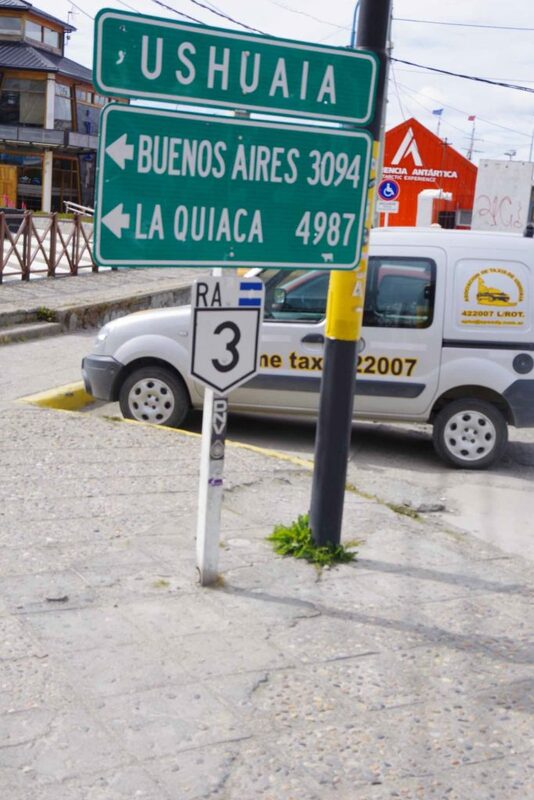 Sign giving distance back to the Bolivian border. 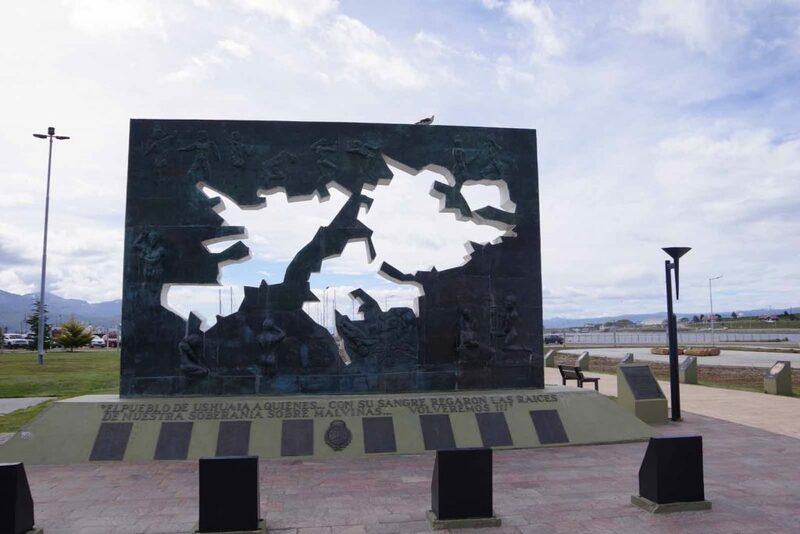 Part of a more elaborate Las Malvinas memorial. By now, I remember outline of the islands well. 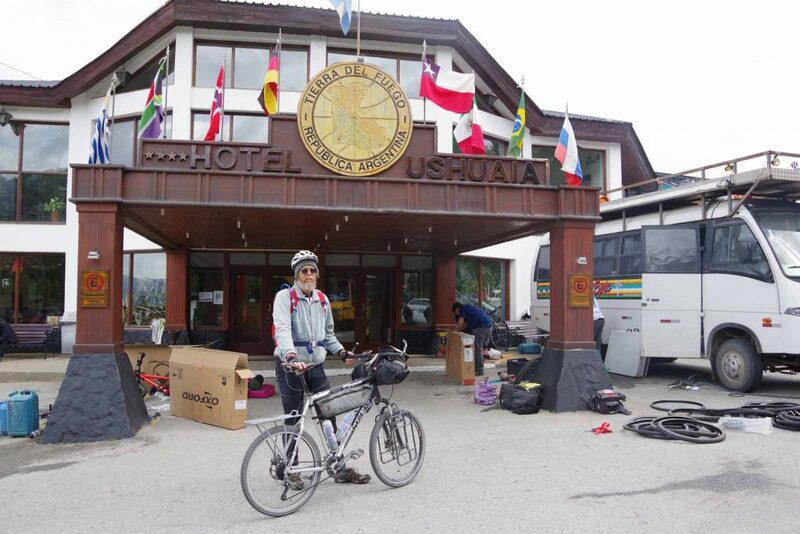 A ferry ride followed by four days of cycling brought me to Ushuaia to complete the trip with our arrival yesterday. My bicycle is already boxed and I will have two days here as a tourist before flying back. 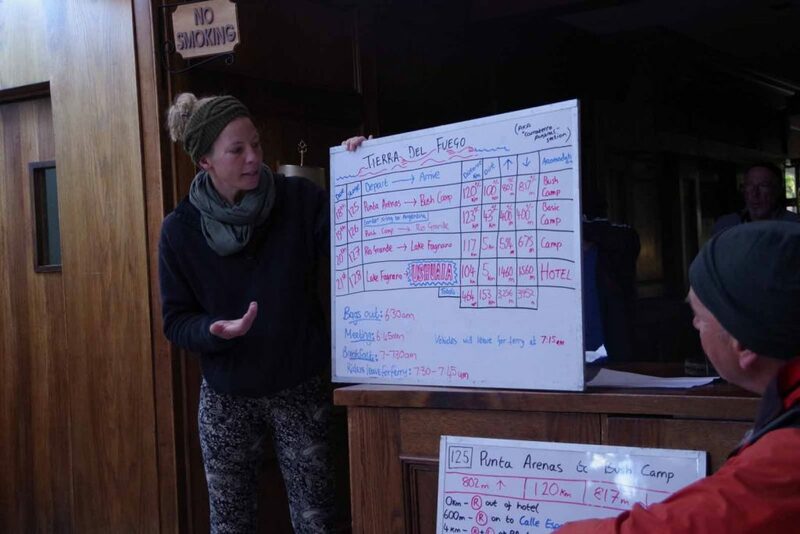 After packing our bags in the truck, we started with breakfast and a rider meeting where tour directory, Emily, reviewed the days ahead. Folks were excited to be getting close to finish, though still a few longer days ahead. The big wild card would be weather: cold rain or strong headwinds would make an otherwise easy day much difficult. 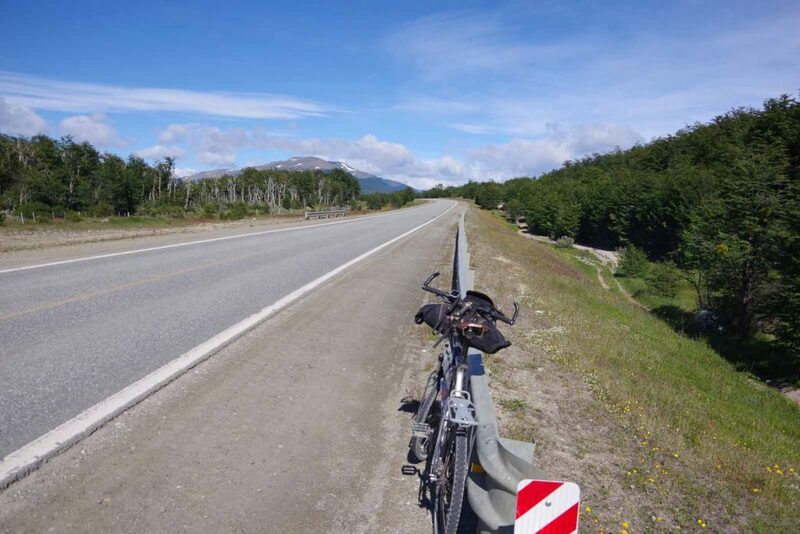 A quick cycle of 5.5km to the ferry terminal where we boarded for a two hour ferry ride across the Straits of Magellan to Tierra del Fuego. 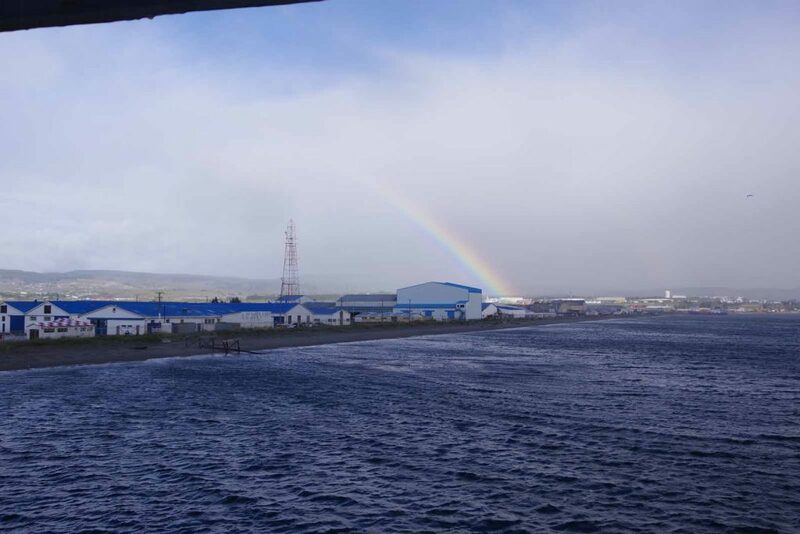 A rainbow over Punta Arenas as we boarded the ferry. 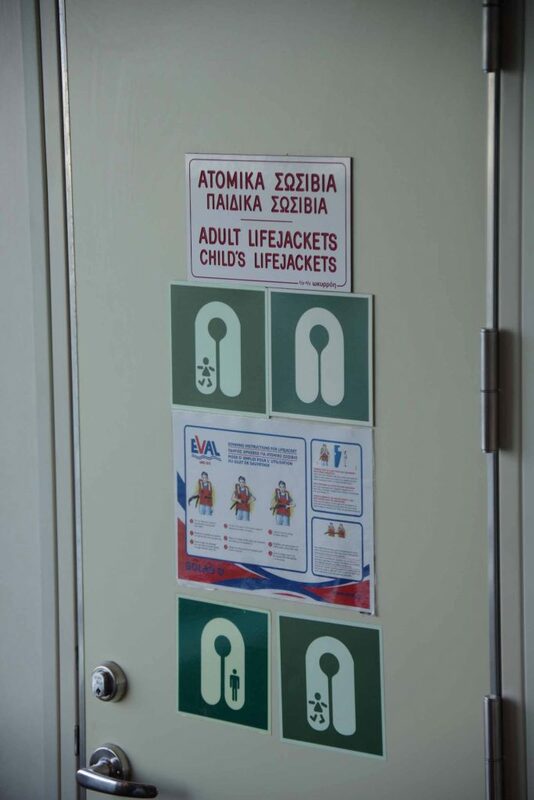 Ferries in Chile seem to have some of their signage in Greek as well as English. 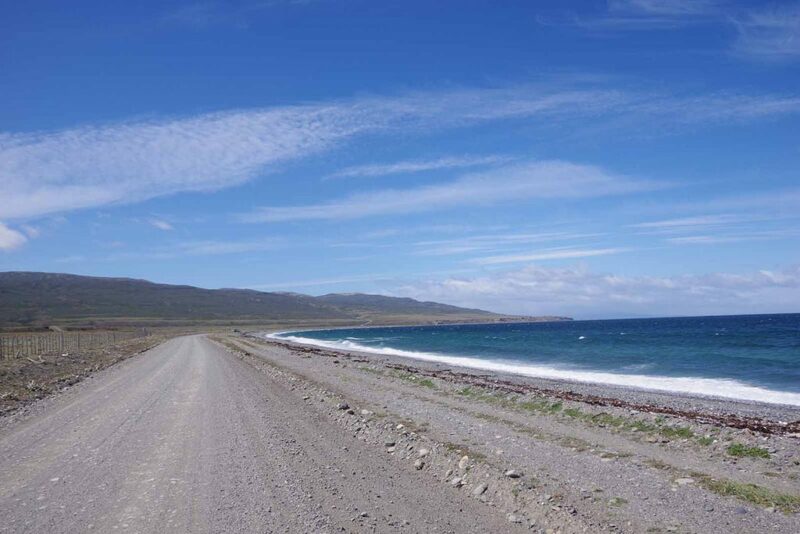 After cycling from port to small village of Porvenir, we found the gravel road heading out of town. The rest of the day was expected to be on gravel. 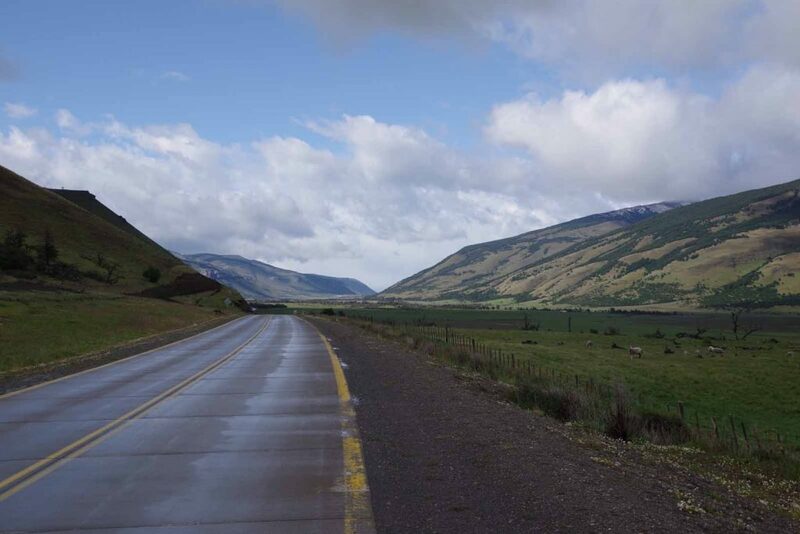 There was occasional washboard areas but overall still a good road. Some pretty riding along the coast. The road was sparsely traveled. In the afternoon the wind picked up. There was a brief turn into the wind, but much of the afternoon was mostly a strong tailwind. For a portion, it was strong enough that winds would carry us along without pedaling. Twelve kilometers before our campsite, we crossed a road intersection and had pleasant surprise to find a new concrete highway. 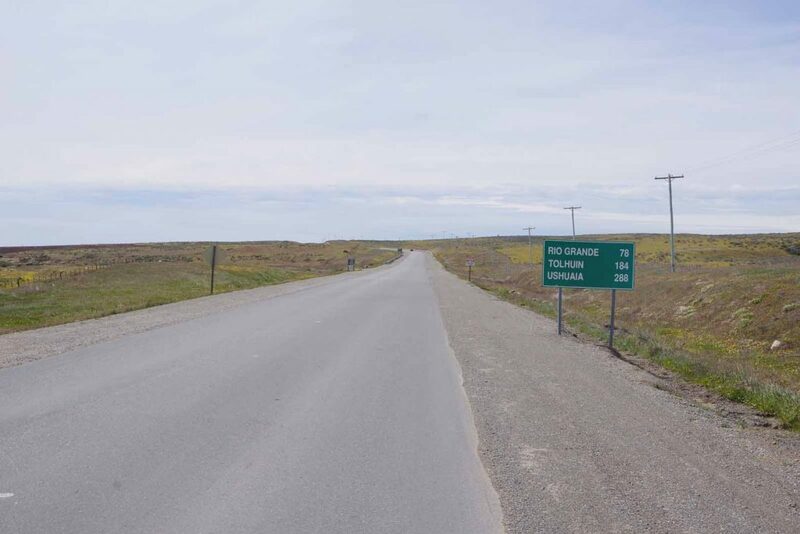 Construction signs still up (for next 45km). While the wind died down, it was still made for pleasant riding. Overall, the ferry ride meant the ride went longer towards late afternoon, but overall not too difficult. 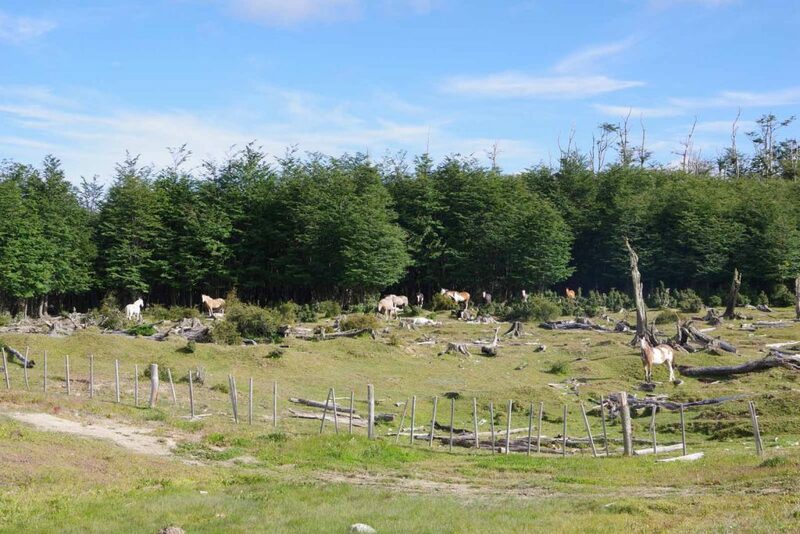 Our camp was essentially in a shallow valley on a side road leading to an estancia (ranch). 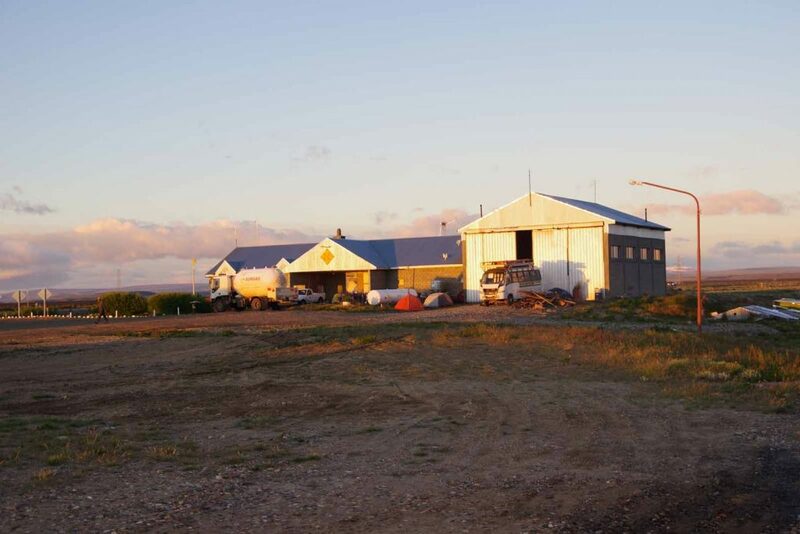 The ranchers were kind enough to allow our group of two dozen plus to camp and we even were allowed to use the outhouse. 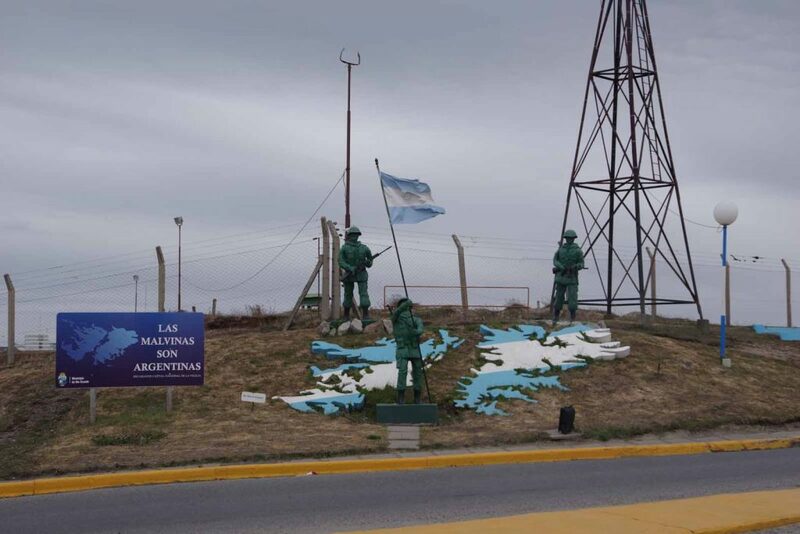 We crossed over to Argentina today. Cycling out of camp in the morning. We didn’t know how long the new road might last. 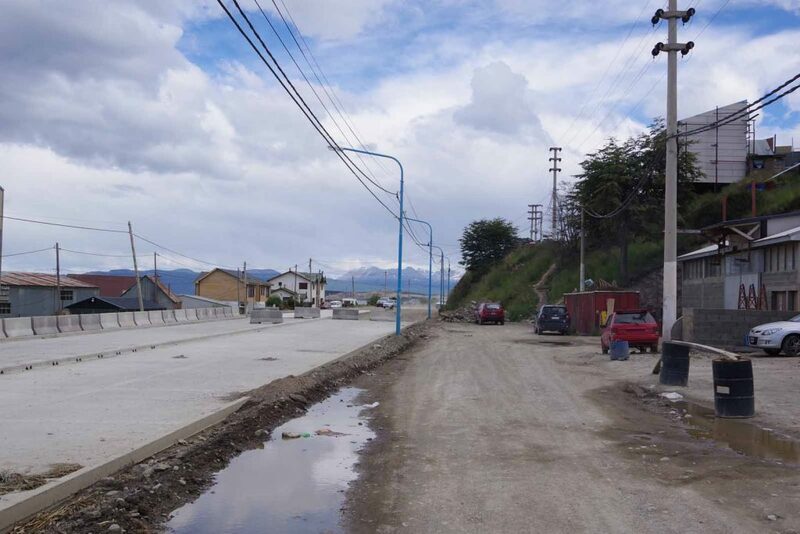 For a few kilometers it was a new completed concrete road. 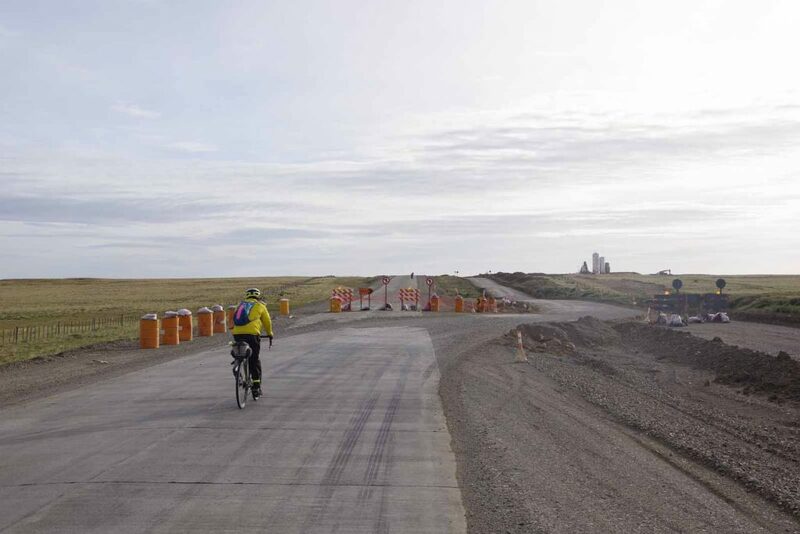 After that, the main traffic was directed onto gravel, but as cyclists we could ride on the not opened concrete sections. Finally after that came construction barriers and gravel for us as well. A short bit later was a village of San Sebastian and then the Chilean border. The border was busy and took a while to wait in line. I took a bit longer since I waited at currency exchange to get rid of my last Chilean pesos. 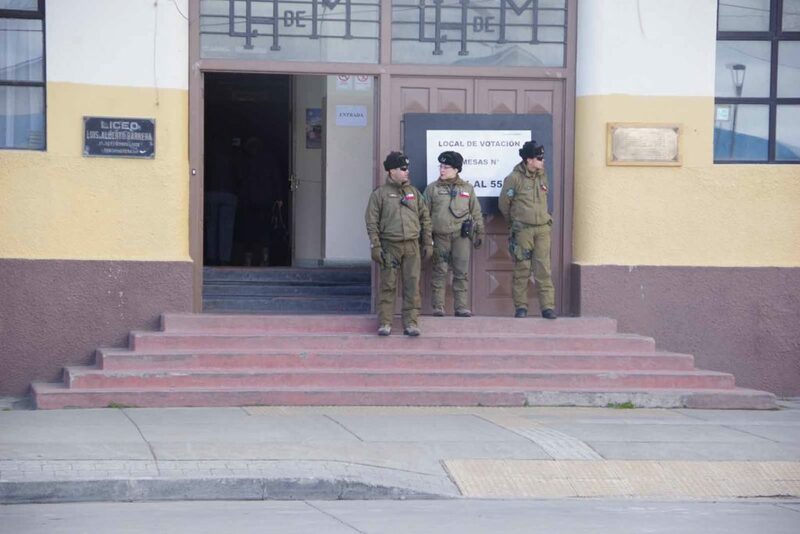 The exit marked final of three visits to Chile. Each entry and exit gets a stamp, so I now had six Chilean stamps and six Argentinian stamps in my passport. Just after was no mans land and Argentian border. 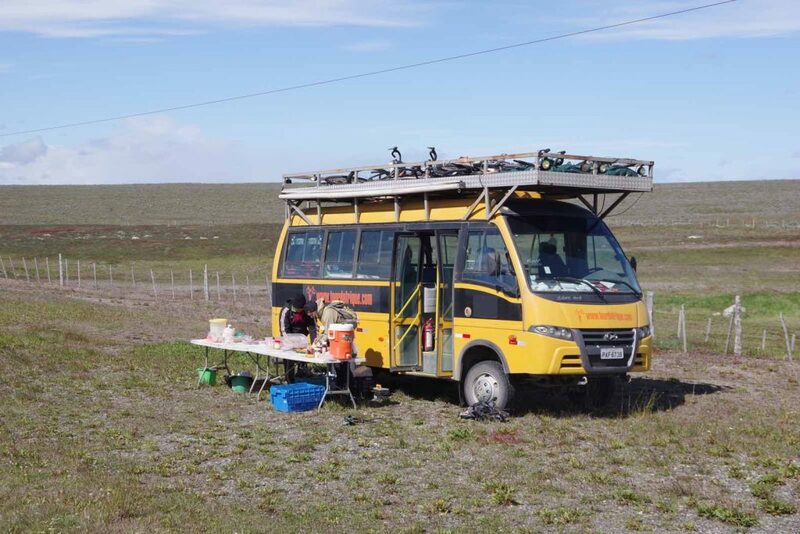 The lunch truck was here as the Argentinians wouldn’t allow fruits or meats into the country. 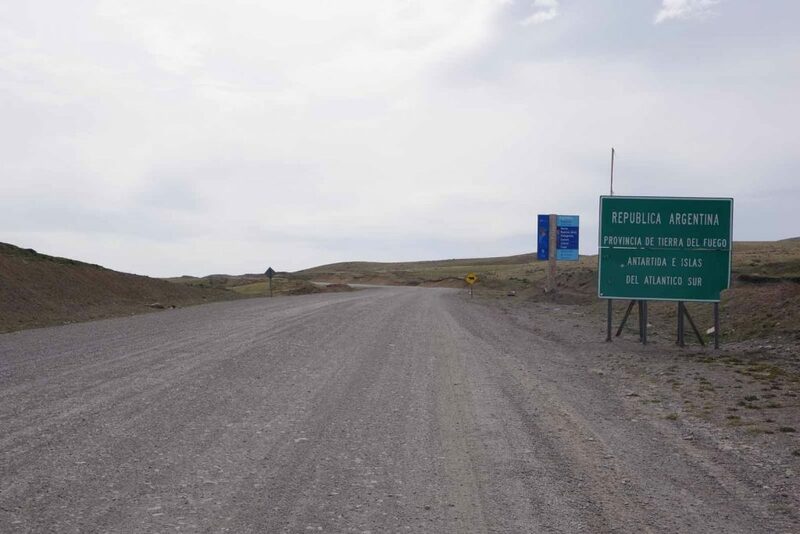 After passing the border, it was on to the more main “Ruta 3”. From here we would keep seeing signs leading to Ushuaia. 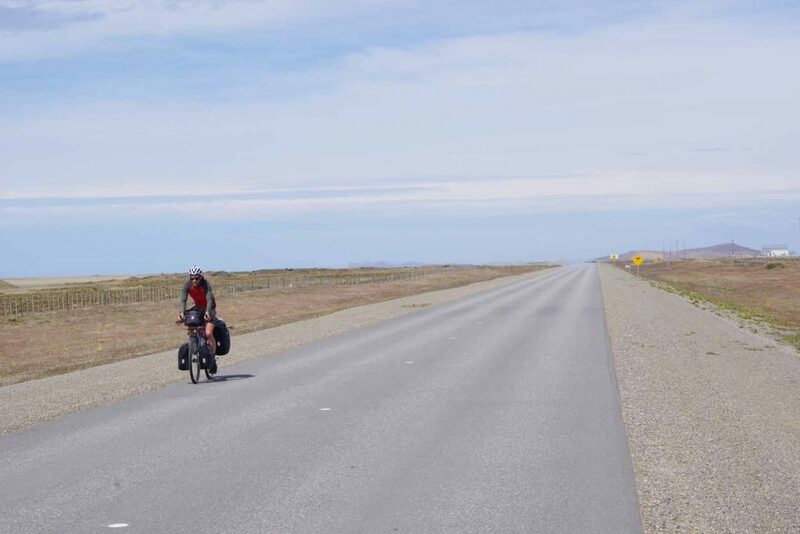 I met a cyclist, Alee, who was into his third day of cycling to Alaska. 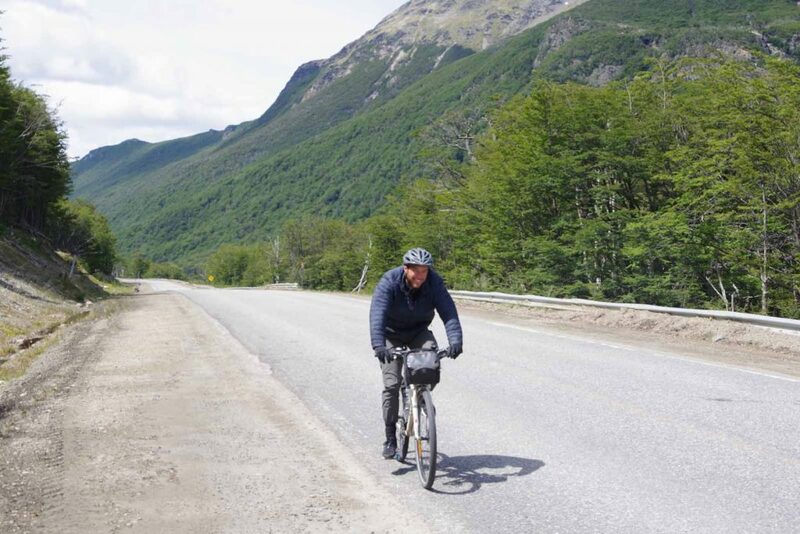 Over the next days as we neared the end, it seemed like we met at least one or two long distance cyclist in Tierra del Fuego. 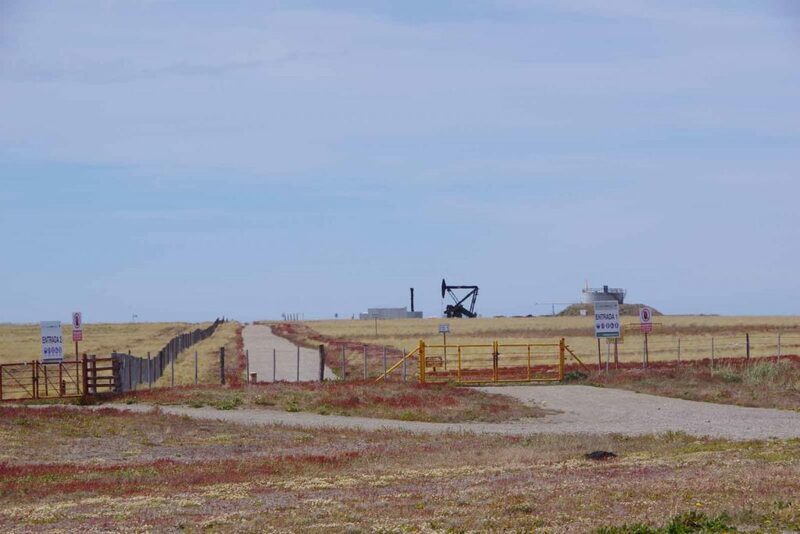 The area around Rio Grande seemed to have small pumper wells as well as some gas lines. Unfortunately also a reasonable amount of truck traffic as well as these signs with yellow stars to mark fatal accidents. As riders we were fine, but I did get the sense that truck drivers near Rio Grande are worse drivers around cyclists than elsewhere. 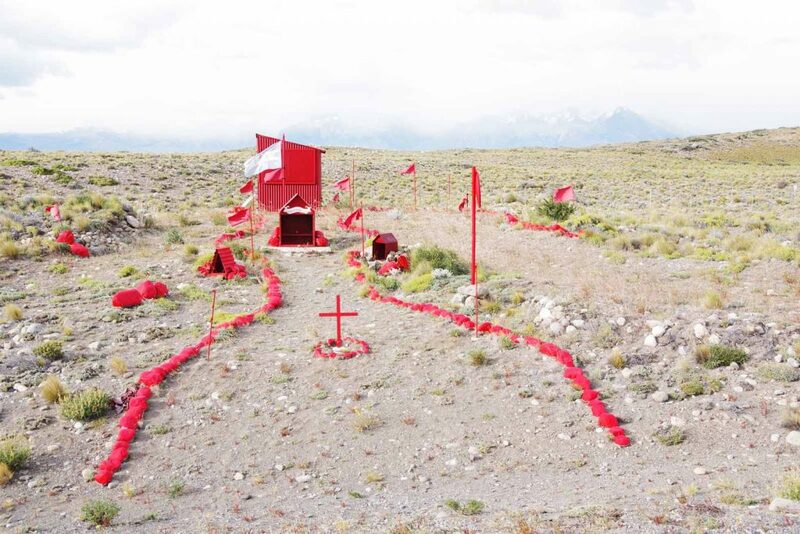 Coming into Rio Grande, a more elaborate shrine to the Falklands. We were camped at a horse riding school. It was a bit of a blustery windy night with a little rain, but by morning the tents had dried out again. Today we finished cycling along the Atlantic and also started to come to area where landscapes changed. We went from area of more arid windswept plains to one that was still windy but started to have more trees and bushes. 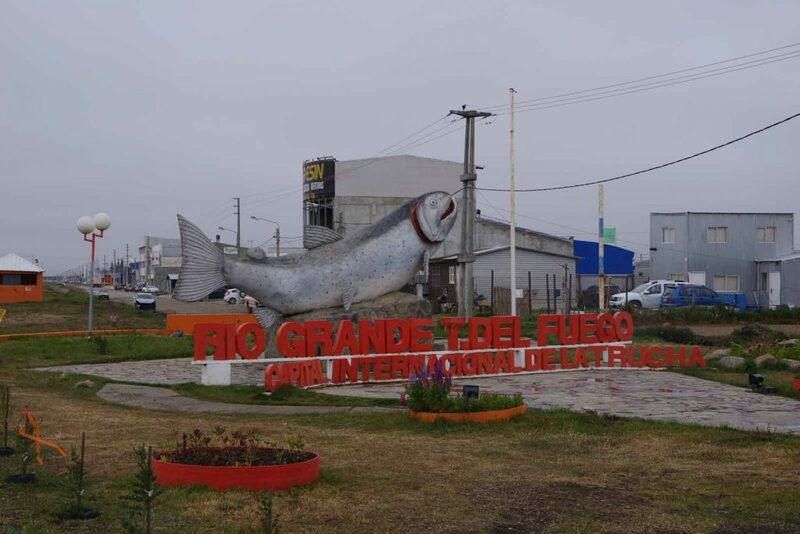 Rio Grande is the international capital of trout. Leaving today we turned more into the wind. 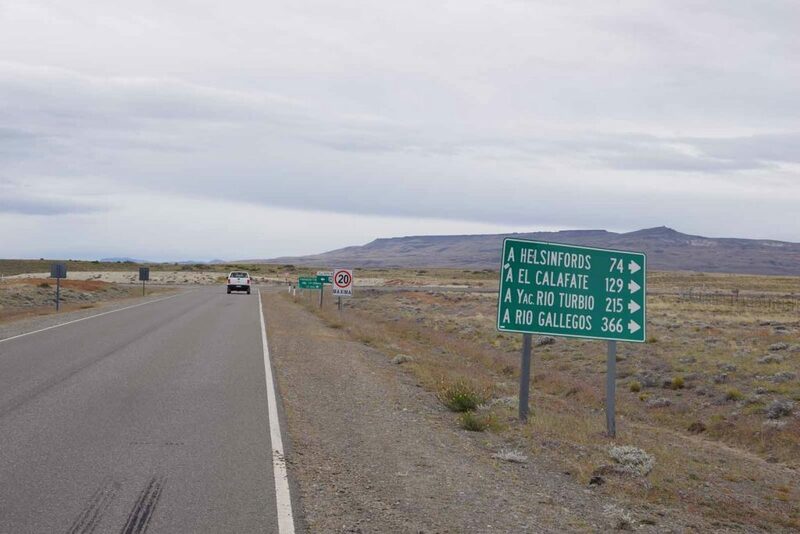 In addition to marking a decreased distance to Ushuaia, this sign also marked 12,000 kilometers since I had left Cartagena. 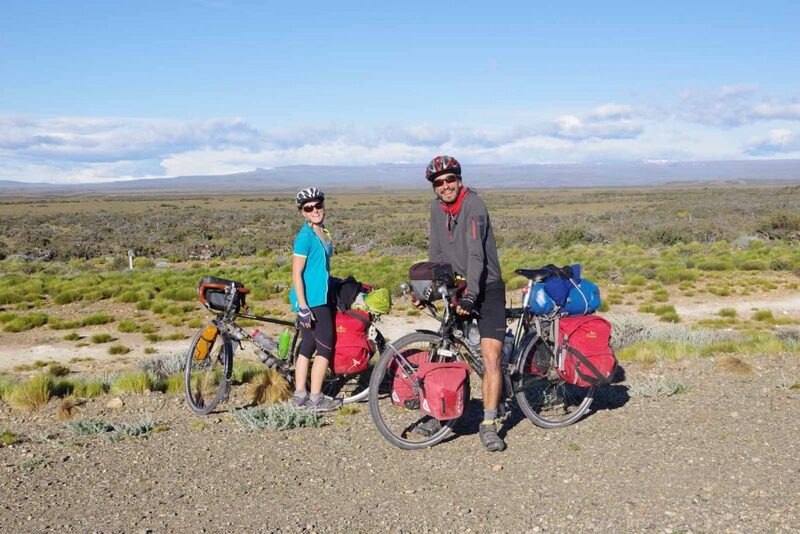 Tony and Sarah from the UK had started cycling in Alaska and were also working their way to Ushuaia. After lunch one starts to see some bushes. Horse riders along the way. The last few kilometers brought us along Lake Fagnano on a rather poor gravel road. There was a strong wind wipping across the lake. Fortunately our camp had some wind breaks. I pitched my tent inside a wooden teepee that helped the wind. 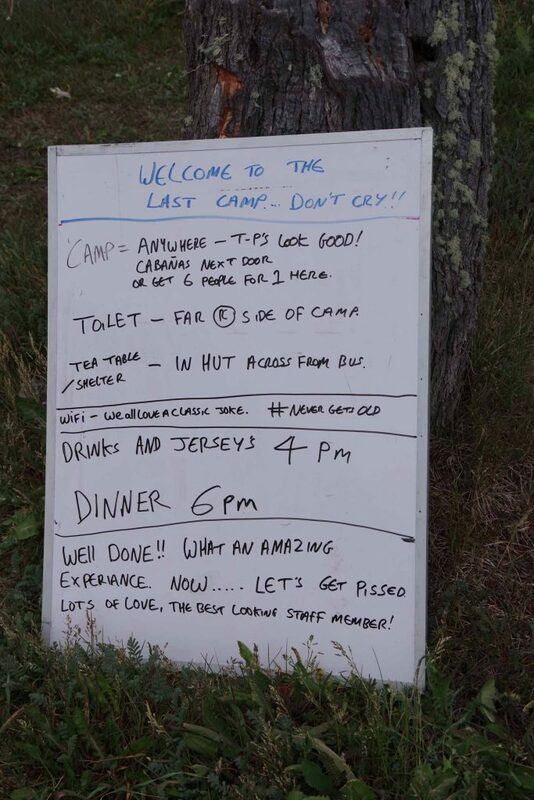 Whenever we arrive at camp, there is a white board with general information such as where to pitch tents or locations of the bathrooms. This afternoon we also had a celebratory wine and cheese. While we still had a day of riding to go, that was expected to be hectic, so we did some of the end celebrations now. The staff presented informal awards that were generally fun and in good taste. For example for the rider with most interesting food tastes, the one with the most visits to medical. I received a “Dr Doolittle” award for talking to animals. I think this came from my habits of mooing at cows, baaing at sheep as we passed. 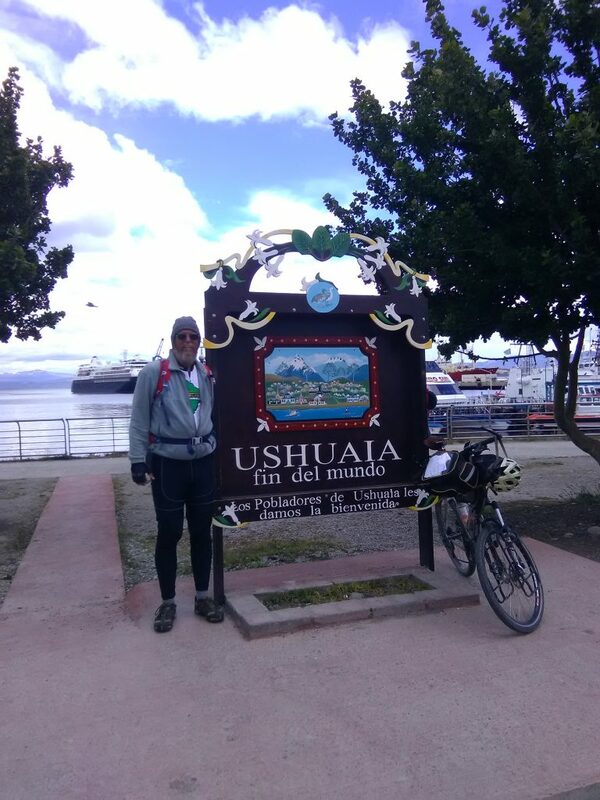 Final day cycling and arrival into Ushuaia. 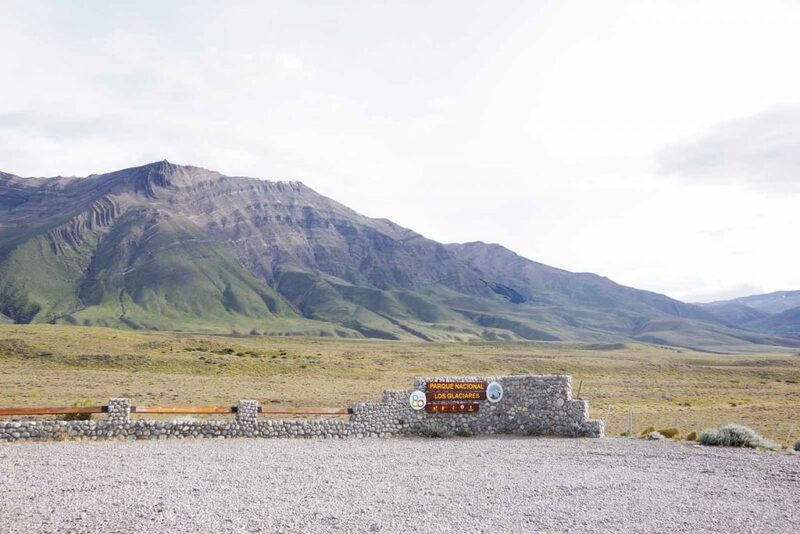 Today we went through much more of a mountainous area again rather than the windswept dry plains we had further north in Tierra del Fuego. Before breakfast we took group photos. Here was the entire group. 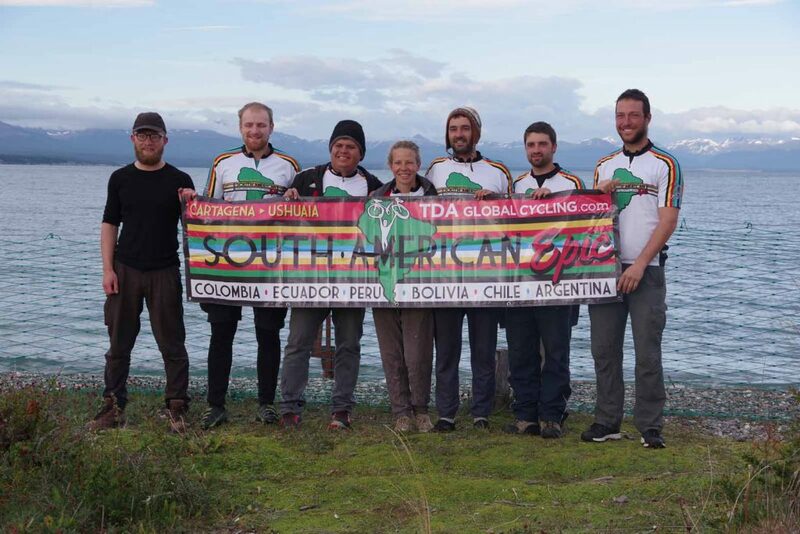 These were the 10 cyclists who have done the entire trip from Colombia. Now back to the rough gravel road along the lake. However, not much wind today which made a big difference. 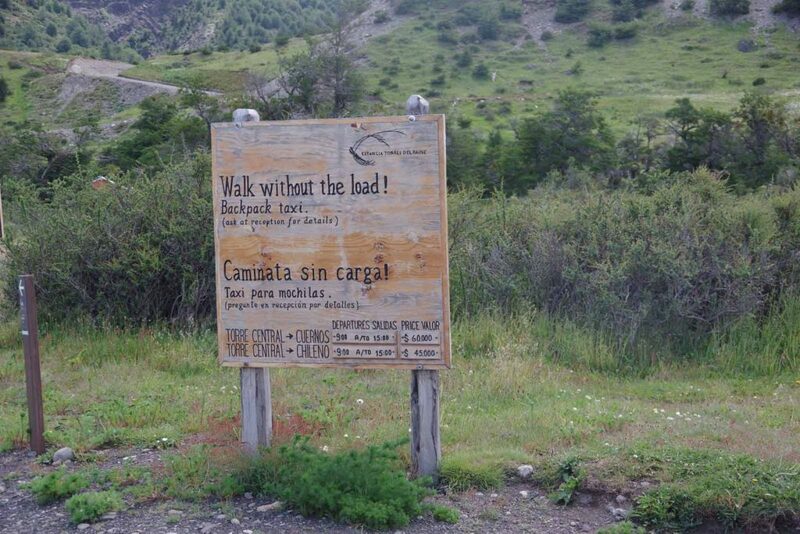 We started along the lake, with a continuation of signs giving distances to Ushuaia. A lot more trees today, also some horses. 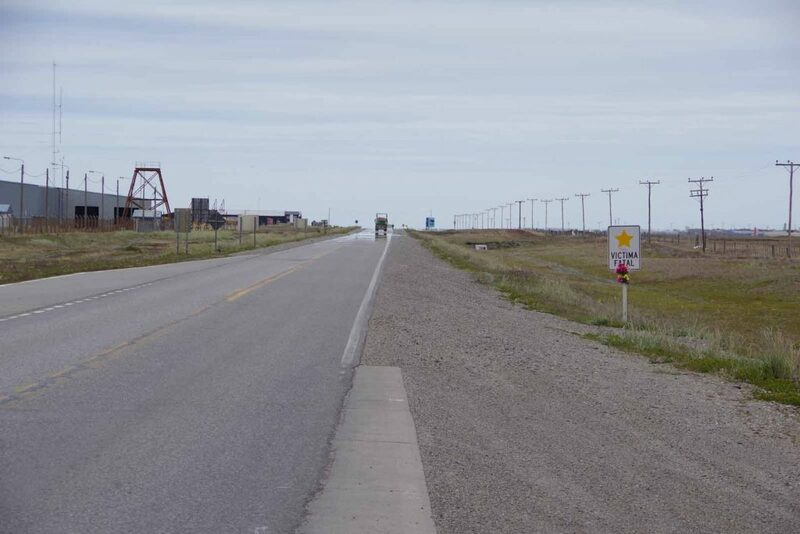 I stopped briefly to celebrate reaching the 27,000 kilometer since Prudhoe Bay point. Signs to describe a gas line being built across this area. After this point we crossed over a low mountain range. Only 300m of climbing so less than before, but still enough to have some good views. Max is one of the staff and was riding “sweep” that day. The overall TDA route was a ride directly through town to end at the hotel. That felt a bit rushed to me, particularly since many of the riders would then be focused on taking apart and boxing their bikes as soon as possible. Instead, I wanted a chance to cycle into middle of town, take my requisite photos and otherwise sit back and reflect on the overall trip before coming to the hotel. So I asked the sweep to continue to the hotel without waiting for me. 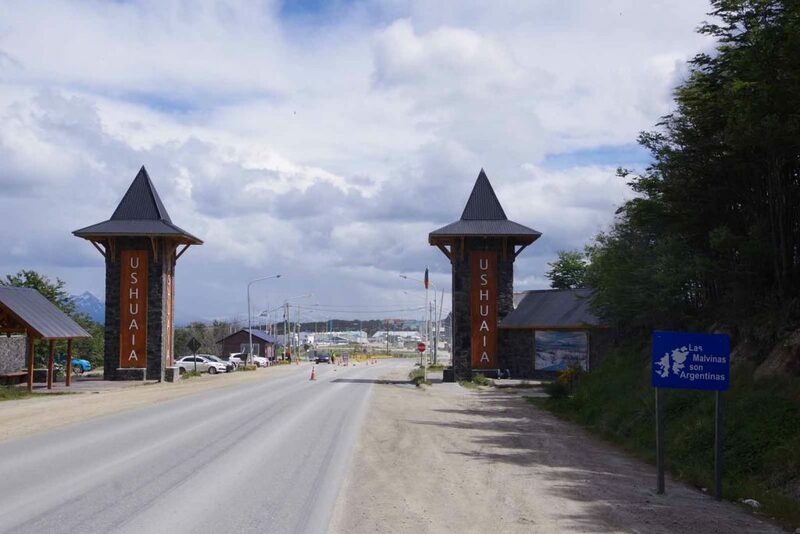 At 95km were the entry signs welcoming us to Ushuaia. I went off the route and via the waterfront rather than the highway to the hotel. 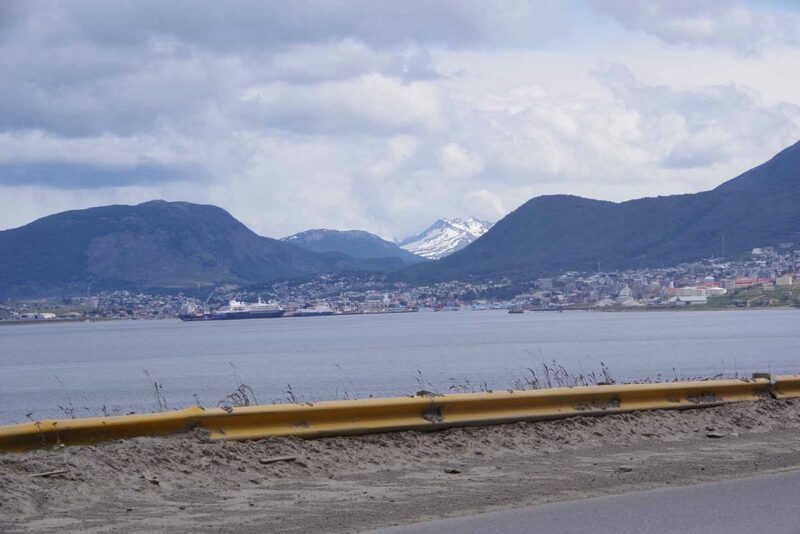 Also shows how Ushuaia is located between the Beagle Channel and the mountains behind. 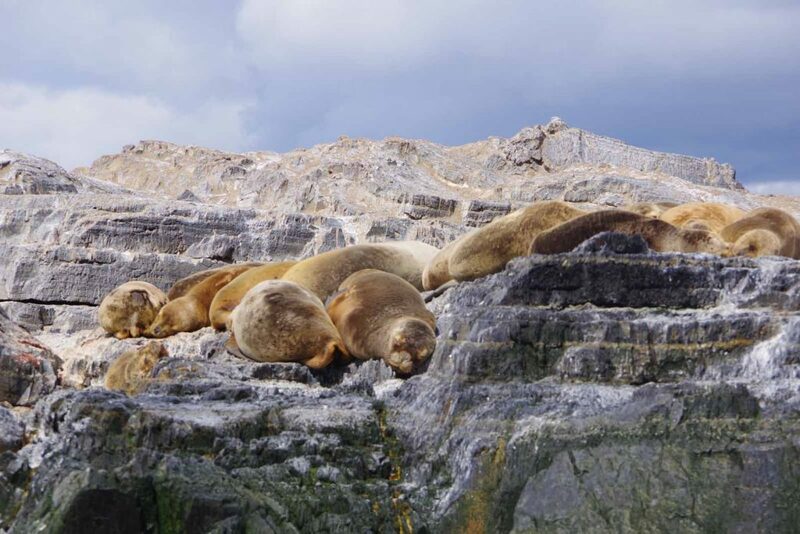 Large ships have several choices of sailing in this area including: the Beagle Channel, around Cape Horn (the Drake Passage) or via the Straits of Magellan. 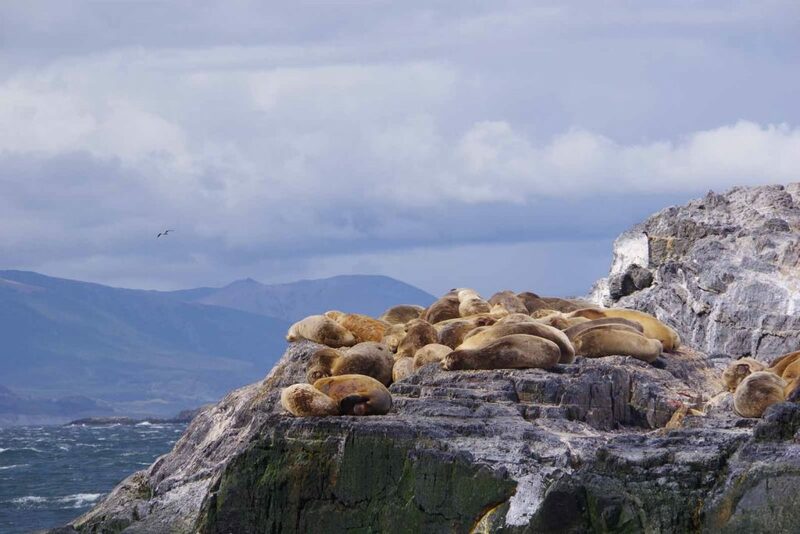 Apparently, the blocking winds make the Beagle Channel often the best choice compared to much large waves near Cape Horn and in bays near Punta Arenas. I discovered the some of the road was under construction, but I was able to wind my way through. I found the classic, “fin del mundo” sign and took the requisite photos here. It was great to finally arrive and I’m glad I at least took time to get into the town. After this I cycled off to the hotel. I boxed my bike and hence the riding was now done. In the evening we had a slide show that commemorated the trip. It was fun seeing the different sections, the last 20% where I was part of the group and also the initial 80% where I cycled through similar areas on my own. The next day, slightly over half of the riders and staff left already to get back before Christmas. Myself and some others are here for another day or two. I’ve walked around town as well as taken a boat cruise, but I’ll make a separate posting for photos from exploring Ushuaia. 18 months ago, I left SCC on the summer solstice. After approximately 13.5 million revolutions of my bicycle wheels, I have arrived in USH on the summer solstice. It has been a wonderful trip and I am grateful I’ve been able to do it. Thanks for your support and encouragement along the way. 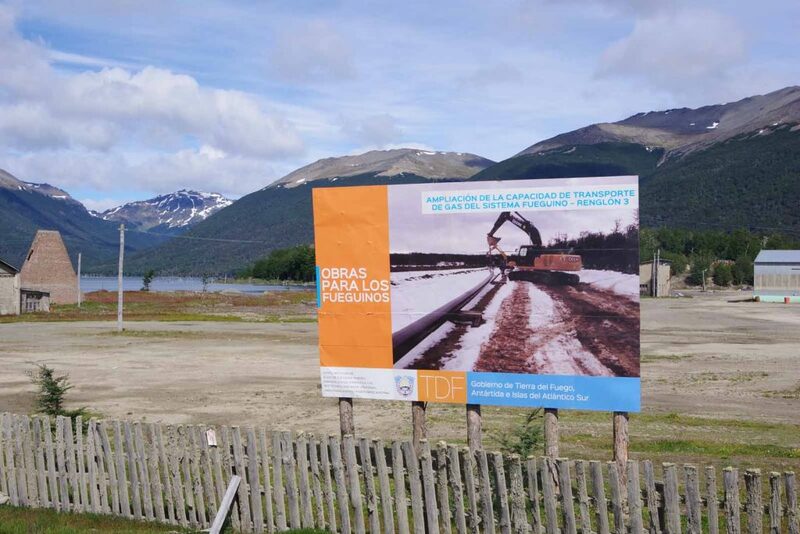 Over the next days I’ll update descriptions for Tierra del Fuego as well as overall summary and reflections on the trip. 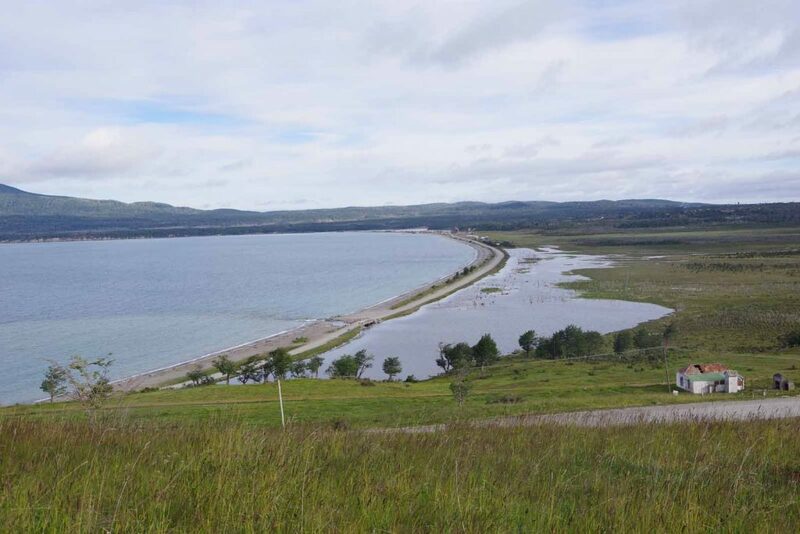 Camped on the shore of Lake Fagnano just over 100km from Ushuaia. The strongest winds died down from this afternoon. We go mostly west from here so hope winds aren’t too bad tomorrow. Today we some of everything including headwind, cross wind and slight tailwind. My tires were pumped up and had a strong ride today. We had a bit of wine & cheese celebration and handed out jerseys for the ride. While my flight back to US isn’t until Sunday, many others already leaving on Friday so anticipate it being hectic with folks boxing bikes, etc so other than evening dinner – planned some of these festivities today instead. 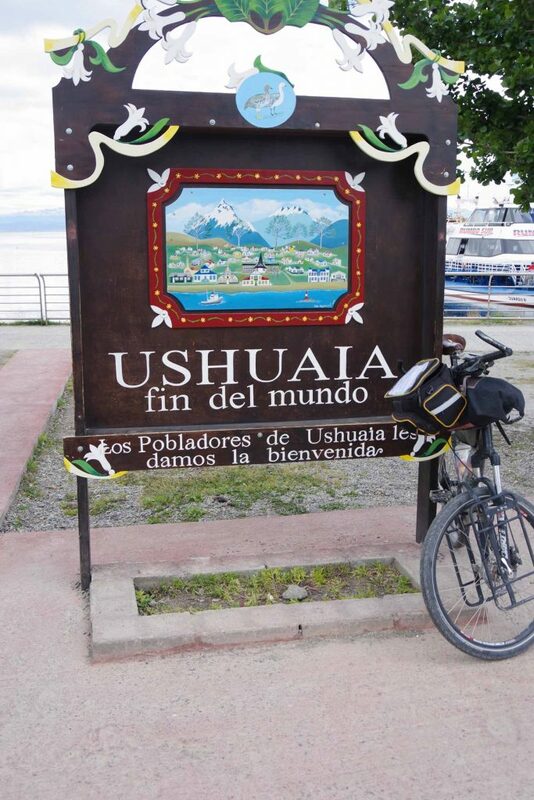 My plan is to skip some of that rush tomorrow and instead take some time to bike through downtown Ushuaia instead and catch the iconic “fin del mundo” sign. First a long ride tomorrow with 1500m of climb and hopefully not too severe winds. Exciting to keep getting closer now. 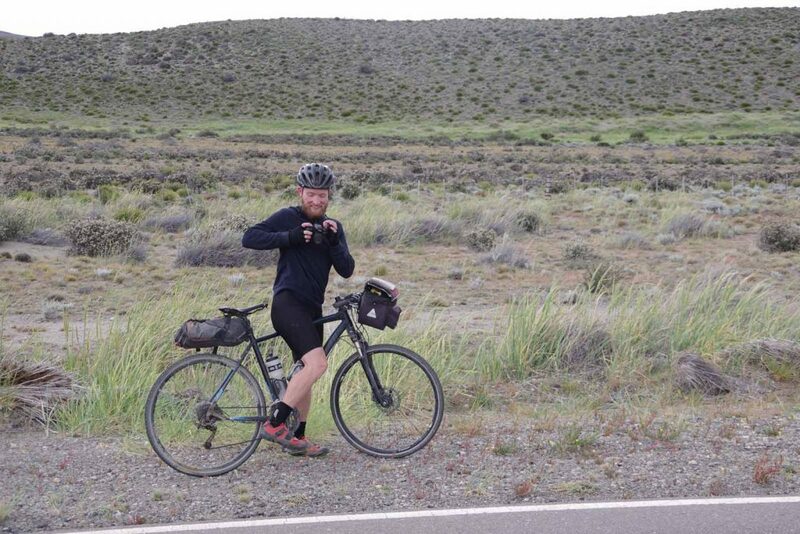 Today we left Chile and cycled along the Atlantic Ocean and ended near small town of Rio Grande. 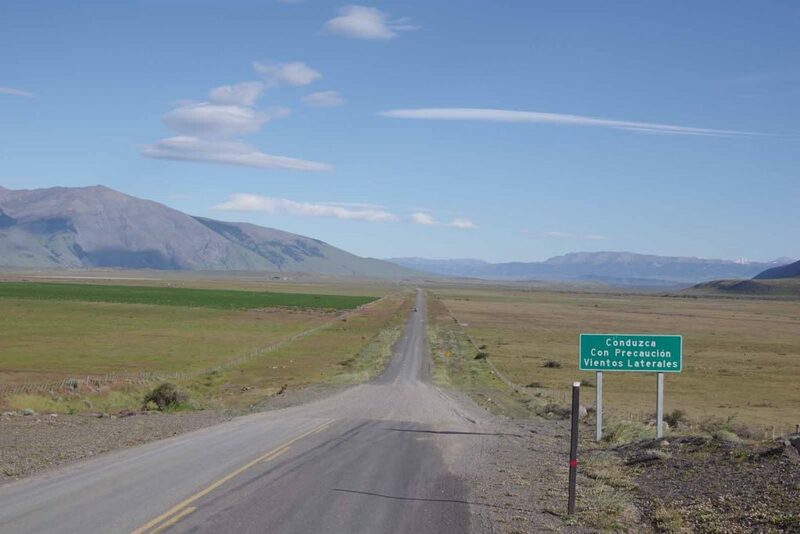 I have now entered and left Chile three times and entered Argentina four times and left three times. Each entry and exit gets a stamp, but fortunately still pages in the passport. Yesterday after our ferry ride it was mostly gravel road riding on sparsely traveled road. We had a raging tailwind that at times pushed us along without pedaling. Whee! 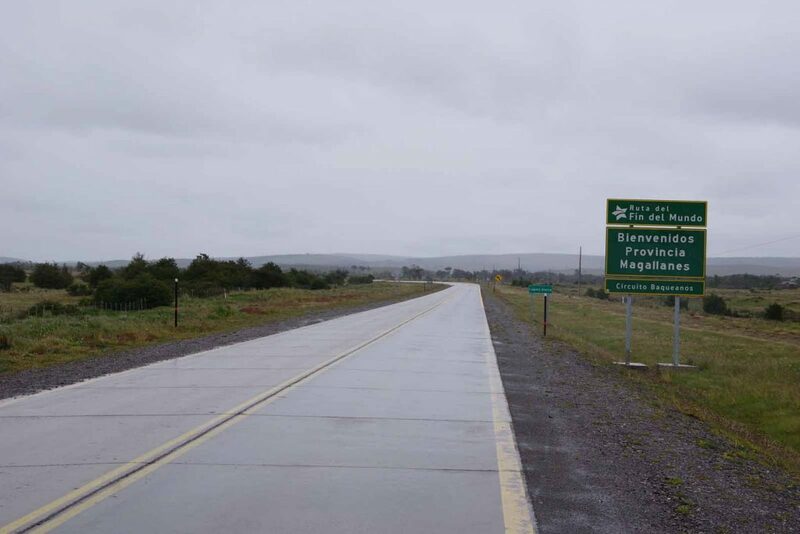 Today after crossing the border back to Argentina, a paved but busier highway. Mostly flat, more tailwinds than headwinds and long open spaces. 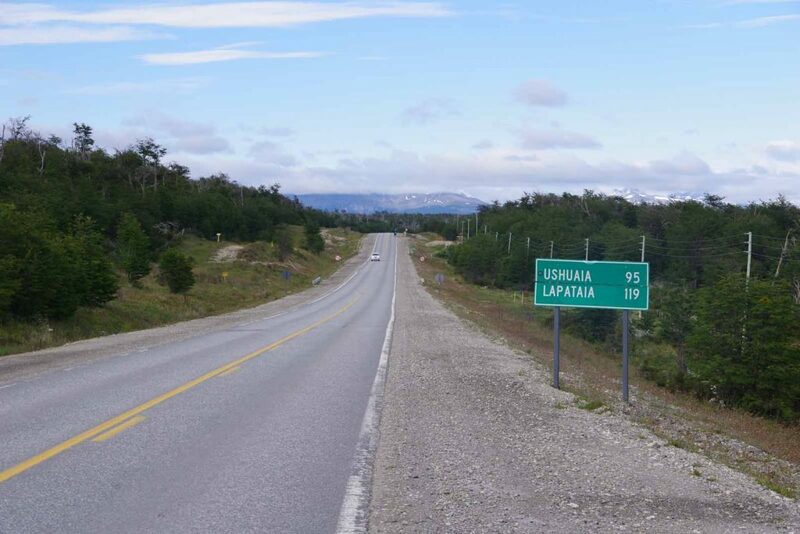 The highway signs now also keep listing distances to Ushuaia. 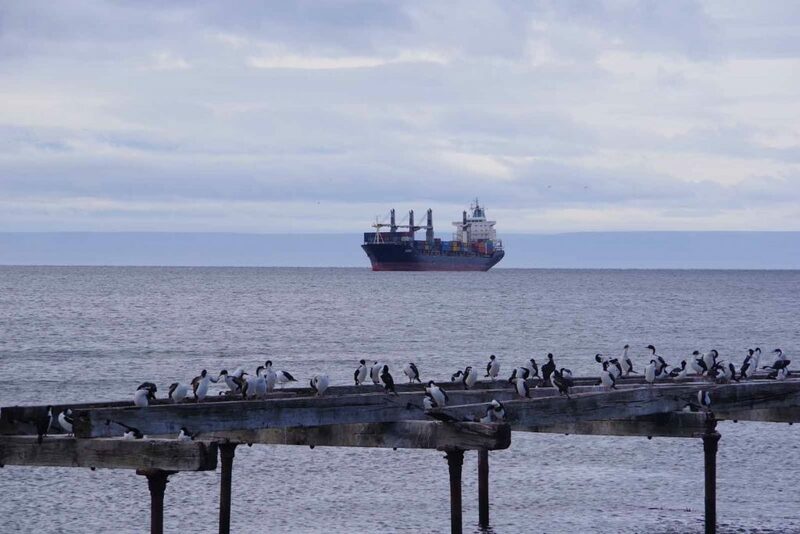 A quiet rest day in Punta Arenas. Nice hotel, good internet and a quiet Sunday. In addition to being a Sunday, today is also election day. A voting station shown above. Most shops and restaurants also seem closed, though the Unimarc supermarket nearby is open. Got my standard tasks done: getting laundry done by hotel, cleaned and checked my bicycle and updated blogs. Then time to look around as a tourist. Not far from here is the Shakelton Bar. 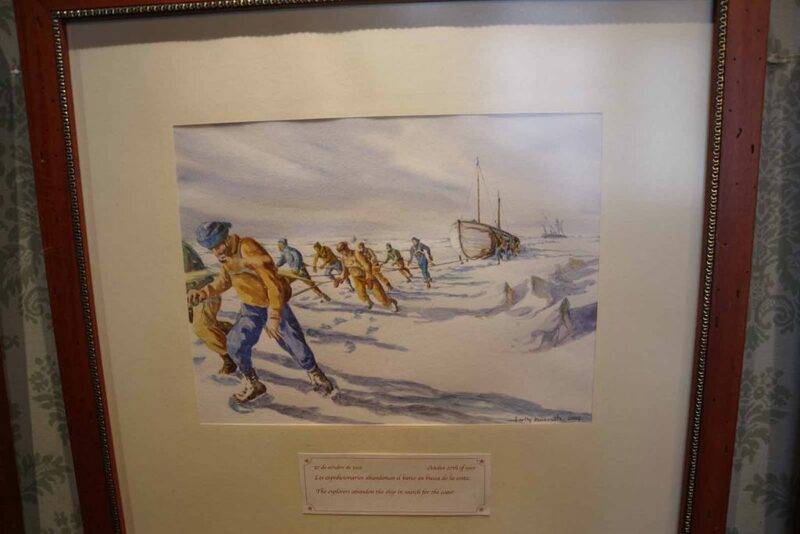 No alcohol on election day, but interesting drawings such as this one about the expedition. 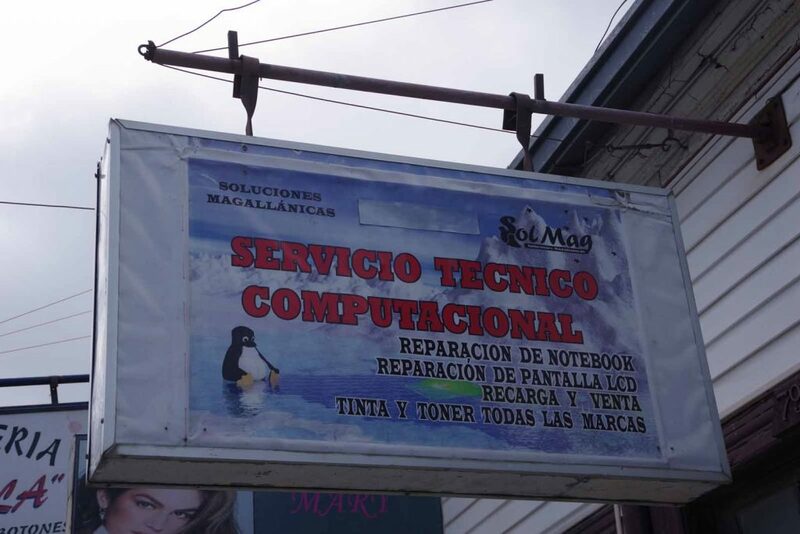 Punta Arenas is one place where penguins can show up in computer repair signs, without necessarily meaning linux. 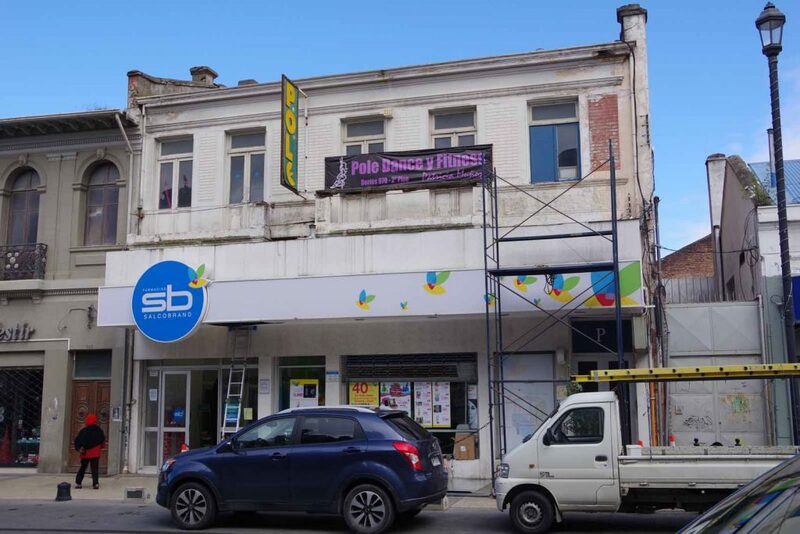 There is a pole dancing school. Ornate buildings near the town square. 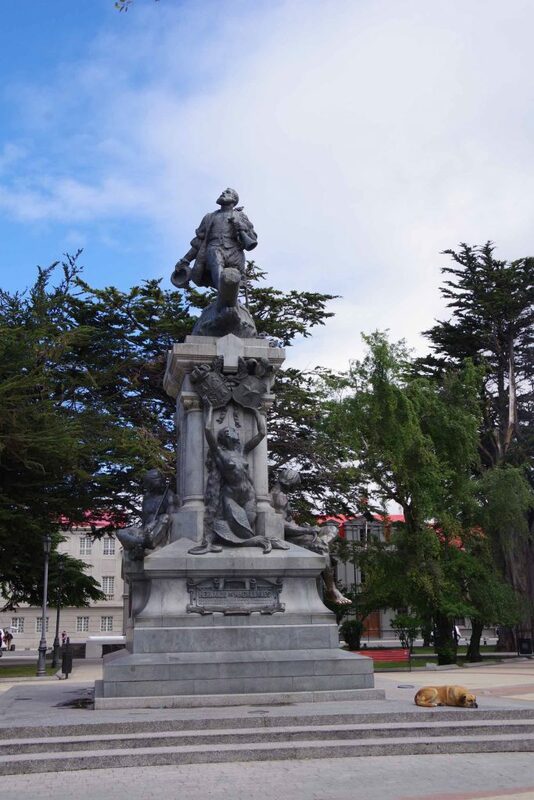 In center of the square is a monument to Ferdinand Magellan. As you know, Magellan was first to sail around the world. 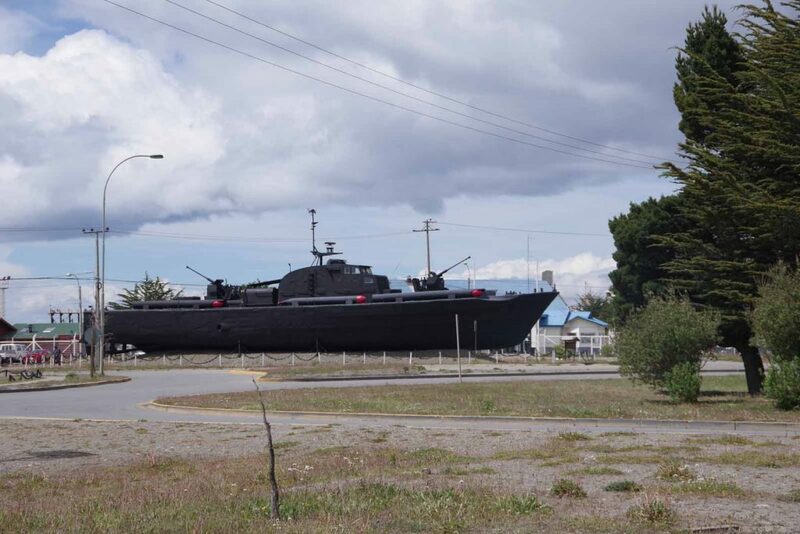 He came right past this via a gap known as the Straits of Magellan. Across the Straits behind the birds and ships is Tierra del Fuego. 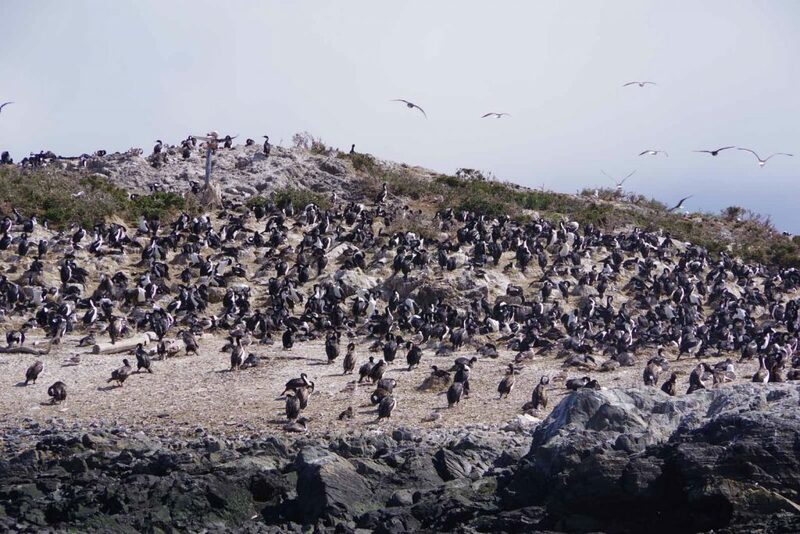 Tierra del Fuego is an area of islands. 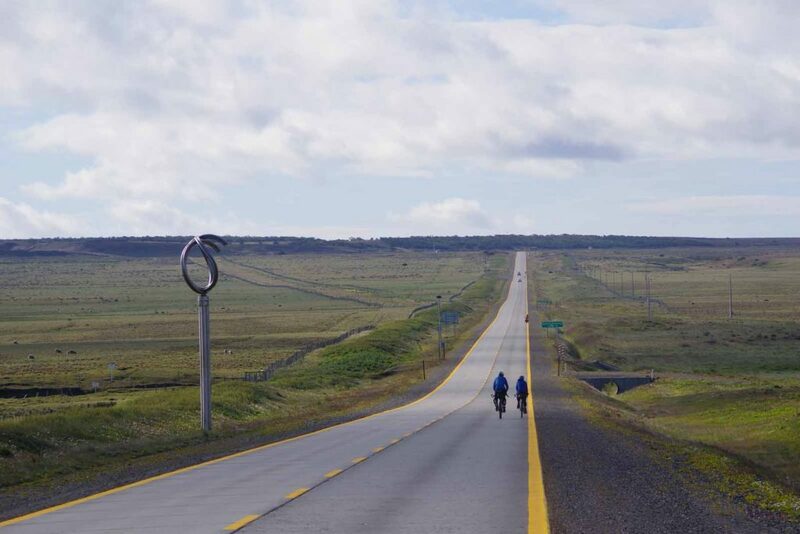 We’ll spend four days cycling across the largest island to reach Ushuaia. Here is schedule for the next four days. Still challenging with ~1/3 of it on dirt, a border crossing, a ferry and some climbing. Add some weather and we have some longer days. Another photo of the birds. 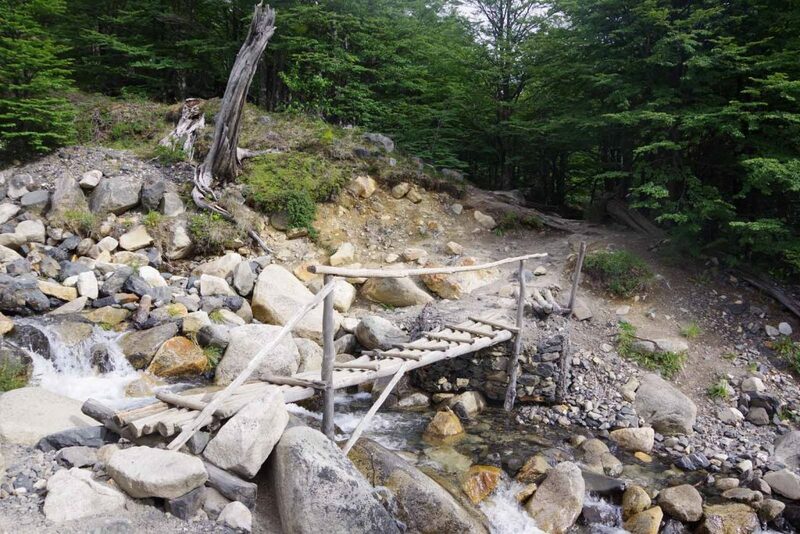 Three nights of camping, so don’t expect to post photos for this last section until we arrive in Ushuaia. Look forward to this next section. 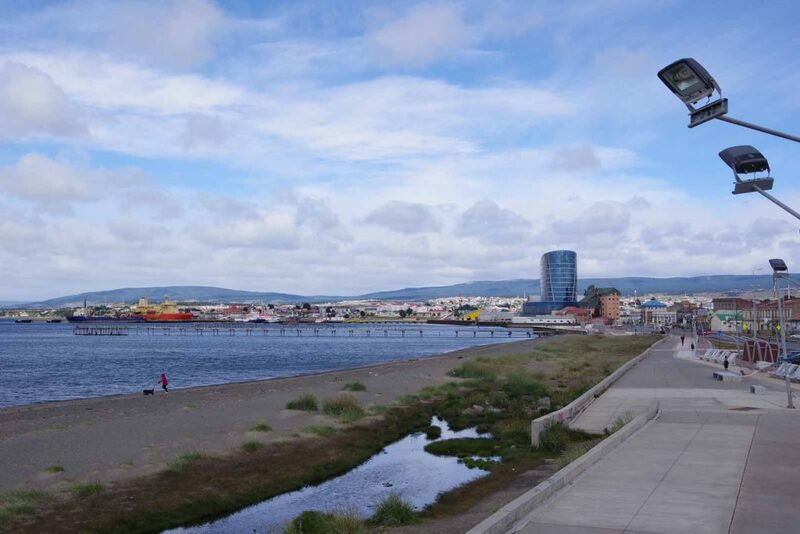 Seven days cycling along with a rest day at Torres del Paine have brought us to Punta Arenas. 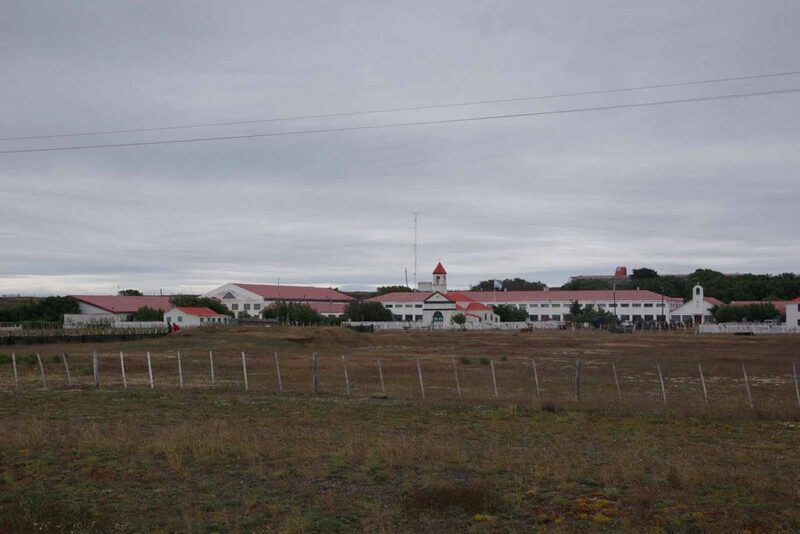 This city of 100,000+ is the largest city in this southern part of South America and sits on the straights of Magellan with the island area of Tierra del Fuego across the bay. 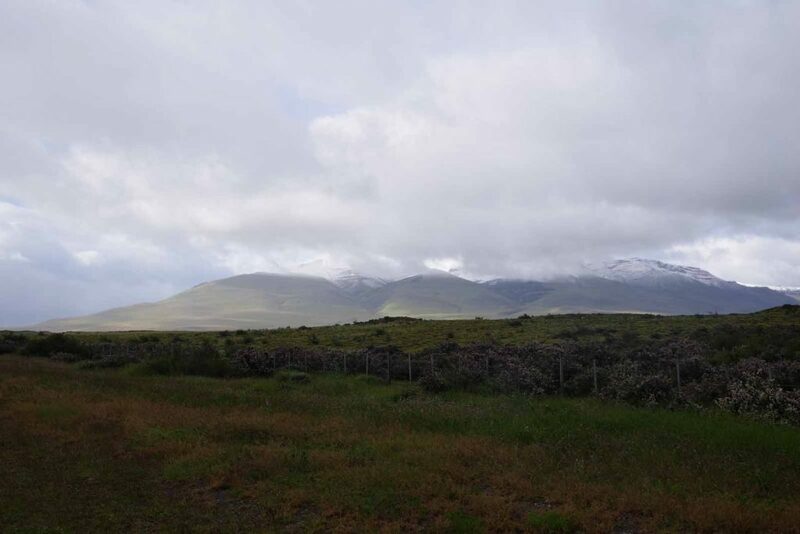 We experienced Patagonian weather on our way here, some wind, some rain and some cold. 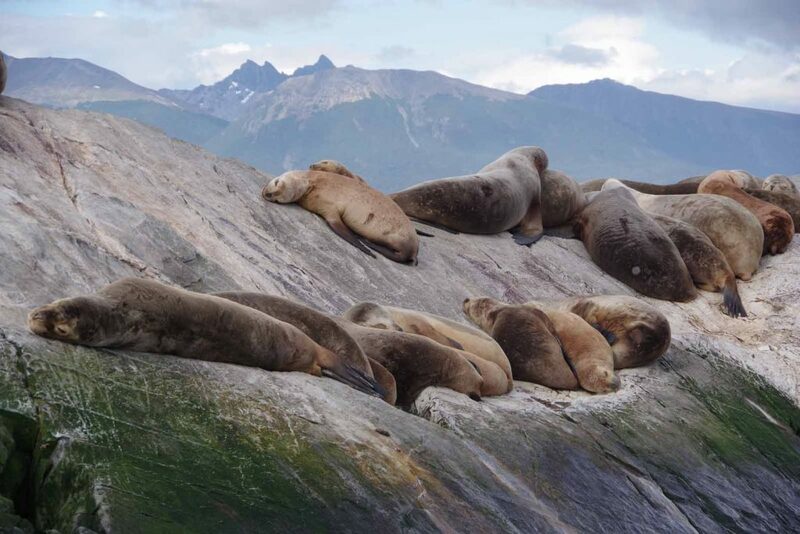 We have a rest day here before four days cycling to Ushuaia. 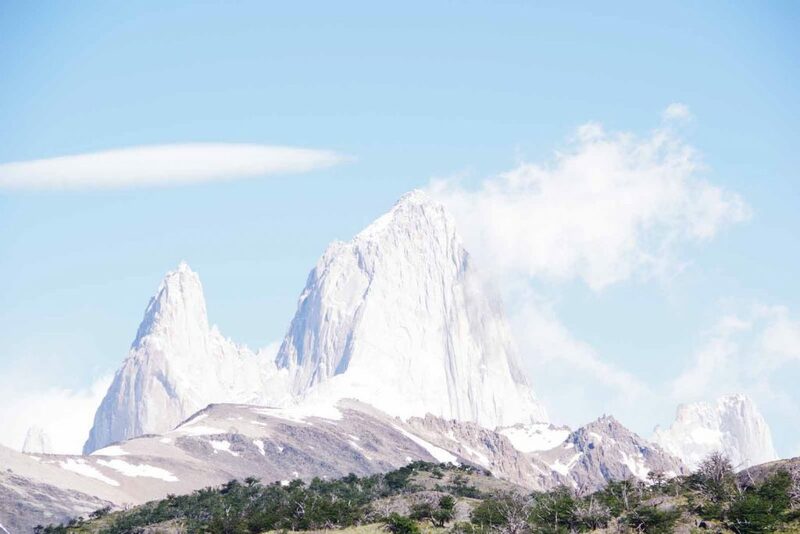 One last picture of Mount Fitzroy from a hike near El Chaltien. Tailwinds! A day when the winds were mostly in our favor with 88km of easy riding and 21km of more difficult crosswinds. A bit of “end game fever” has crept into the group. The tour leader, Emily, mentioned the riding days would now “go into single digits after today” and one could tell, many folks had counted “11” and were quick to correct. It was gusty winds starting out. As the canyon twisted, the wind came from different directions. Sometimes cross, sometimes tailwind, but eventually settling to mostly from behind. Looking back, one could see a glacier up against the mountains. Back to a land with Gauchito Gill shrines. Jacob our staff member responsible for communications, getting ready for a photo. A lot of long straight roads made for easy cycling. 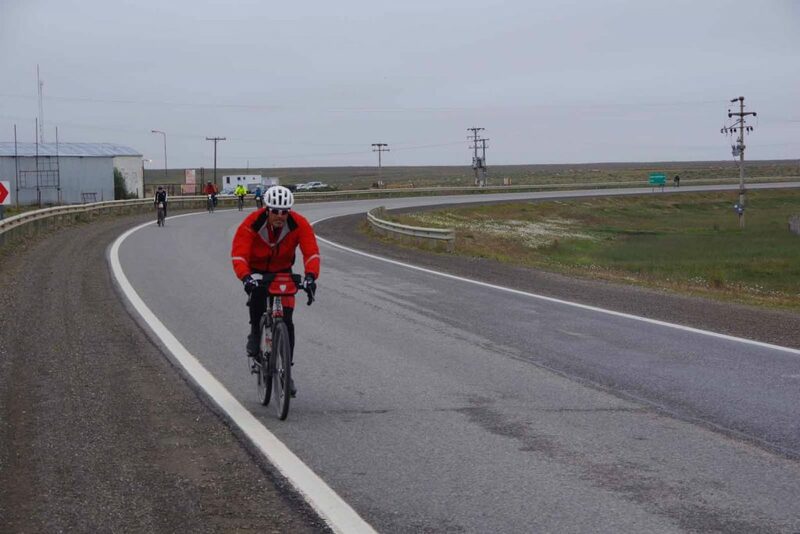 At 88km the tailwinds came to an end as we rejoined Ruta 40 and went more across. This brought us to La Leona roadhouse. 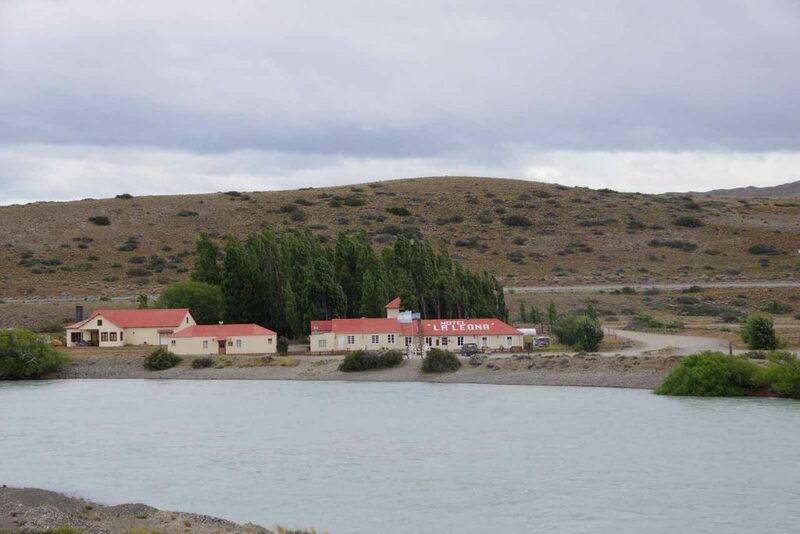 The roadhouse was named because an early settler was killed by a puma (leona) at the point where a river crossing required boats or extra care. The TDA group relaxing while we wait for dinner. A ride of 136km today, but promised to have good strong tailwinds. For the most part these were manageable with only the last 35km on top of the mesa with extremely gusty winds that sometimes made it difficult to stay on the right side of the road. Fortunately, not much traffic. 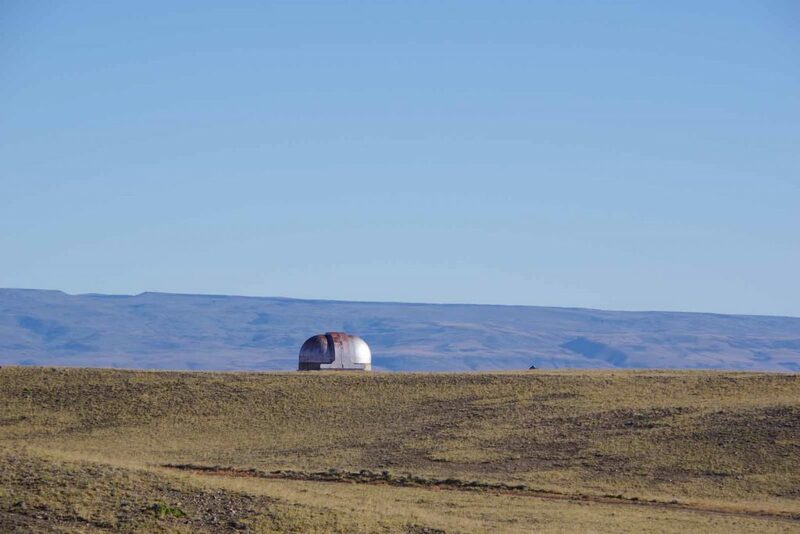 We passed what looked like an observatory. This first part went along a wide canyon. A herd with several of these animals not far from the road. Further back were fences so they sometimes ran parallel to our direction for a while. Looked like an emergency box. From 84km to 102km we had a steady climb around 6% grade that brought us to top of a plateau. The climbing was occasionally helped with a boost of wind from behind. Nice view up top but even more windy. I cycled carefully but on a few occasions found myself blown across the road and off on the left side. 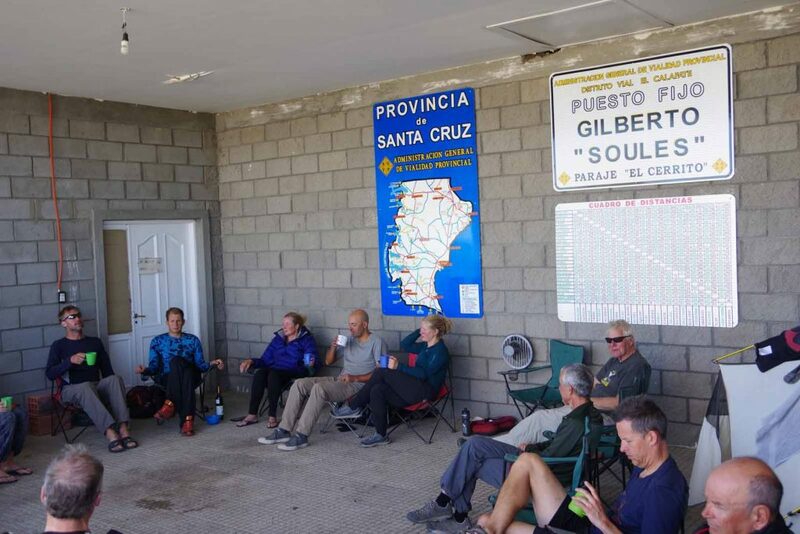 Our campsite of El Cerrito was a road maintenance workshop. The wind was still gusting strongly and hence it was suggested we wait until after 7 pm to set up tents when the wind was typically less. 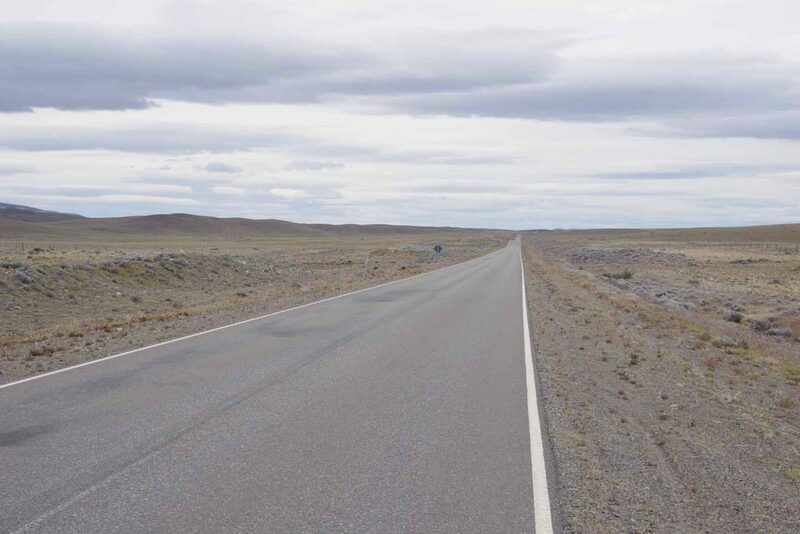 One of the riders of a previous section had left behind some money “for a particularly grim day” and riders had used this to buy some wine and drinks in El Chalten and bring it for this day when we knew there wasn’t much more than a road maintenance camp. Thanks Fred! Nearby was a small maintenance shed. 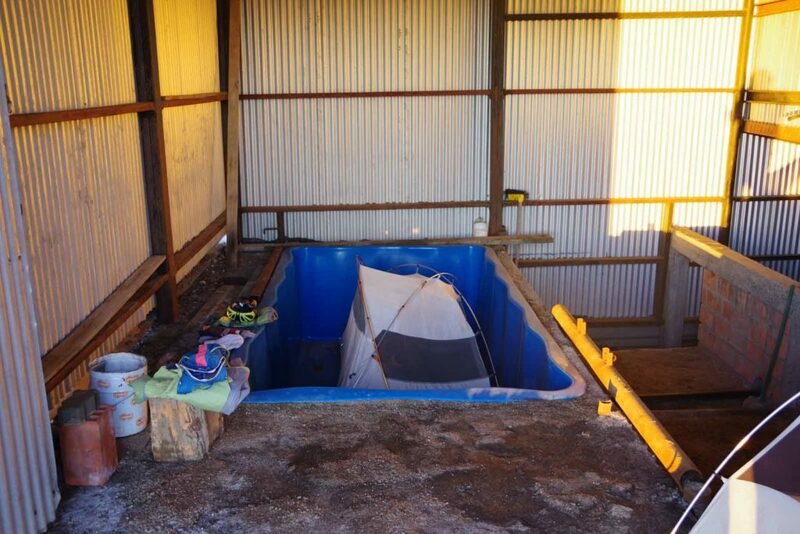 Tom had found a spot to pitch his tent in the bottom of this tub (used to mix chemicals for the road, but now clean?). I set mine up in the same shed, though not in a tub. That night the wind howled through the night and I was happy I was in a sheltered place. A day to cross back over the border into Chile. After howling all night, it was surprisingly calm for a while in the morning. This was good because we the route today would include some travel to the west and two years previously the TDA trip had this a particularly difficult day. We even had breakfast 30 minutes earlier to help riders possibly beat this wind. 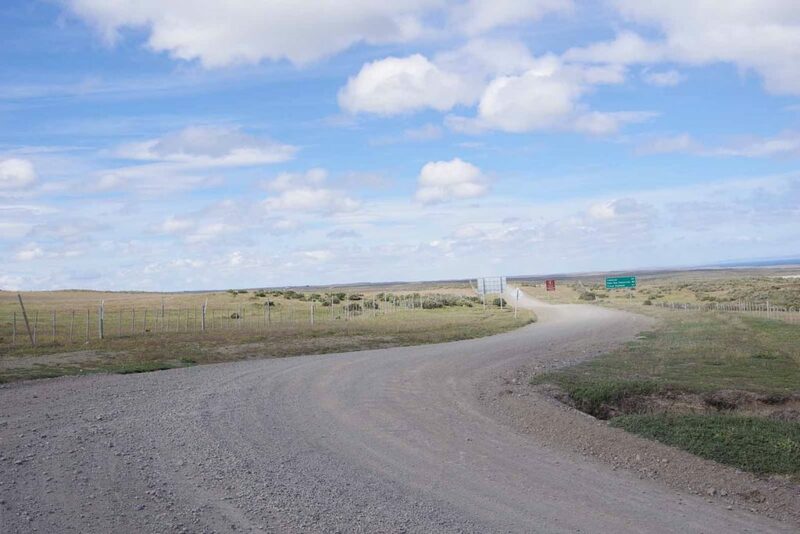 The first 65km were on this gravel portion of Ruta 40. A lot of it was reasonable cycling though there was ~15km in the middle with a large “river rock boulder” section that was particularly rough. These touring cyclists from Quebec had stayed at our camp as well last night. It is interesting to see when these solo cyclists meet with a group like ours, they are often happy or even eager to talk with other cyclists. 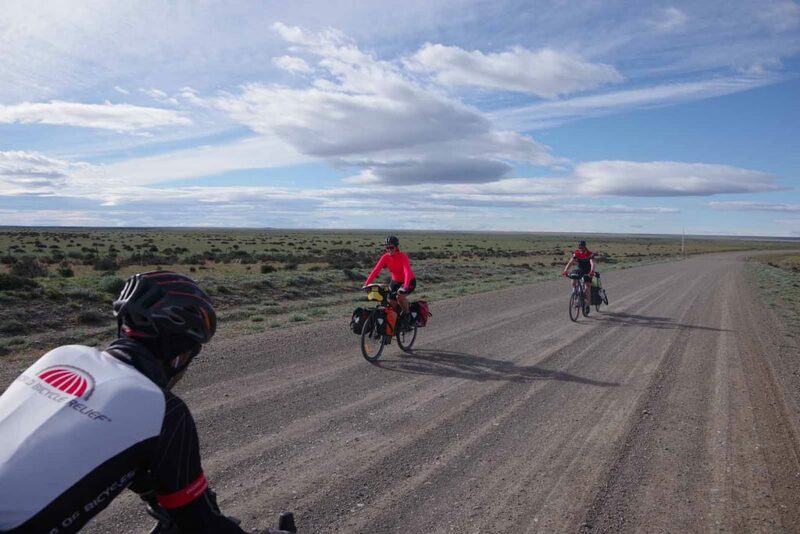 Some more touring cyclists coming the other direction on the gravel road. At 65km was end of the gravel road as well as lunch. 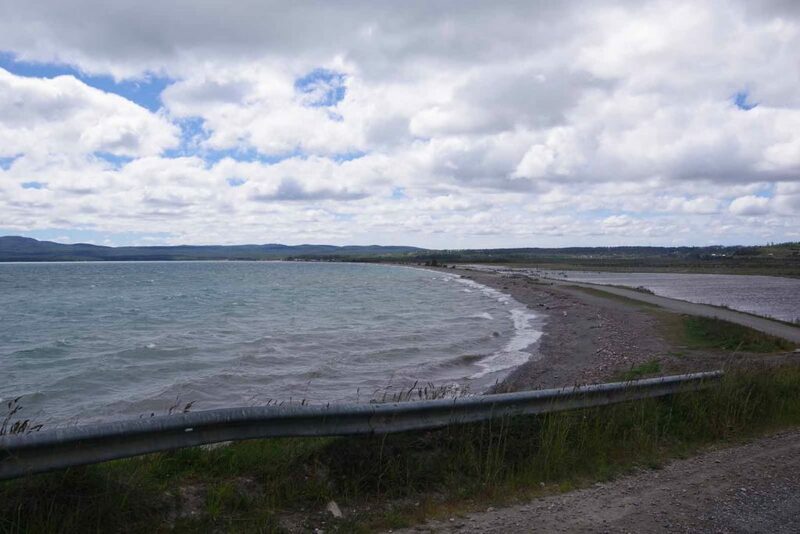 From here the road was paved until 104km but also more into the wind. I decided to take the bus from here as it had been good riding and the riding through open areas with a headwind didn’t seem particularly enjoyable. 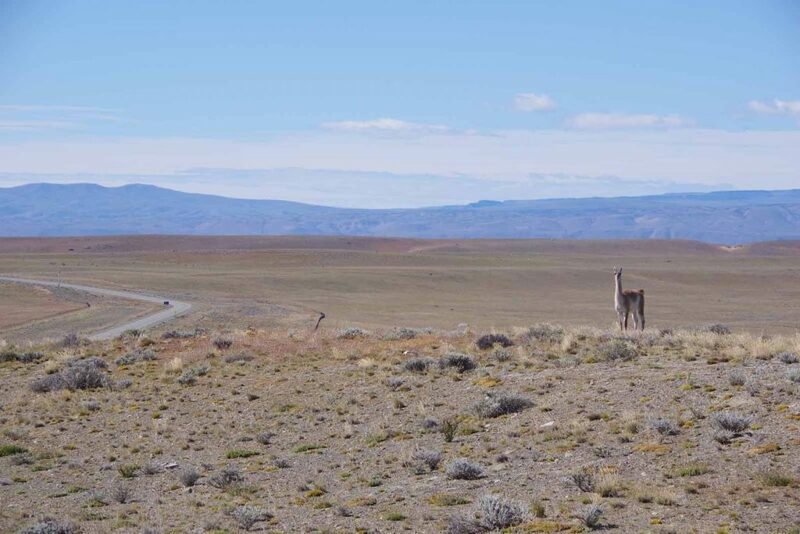 As the bus went along, we picked up more riders and by the time we reached the (gravel) turnoff to the Argentina/Chile border, five riders were all on the bus. I learned later that a number of other riders were also picked up in this area after strong rain storms came through. 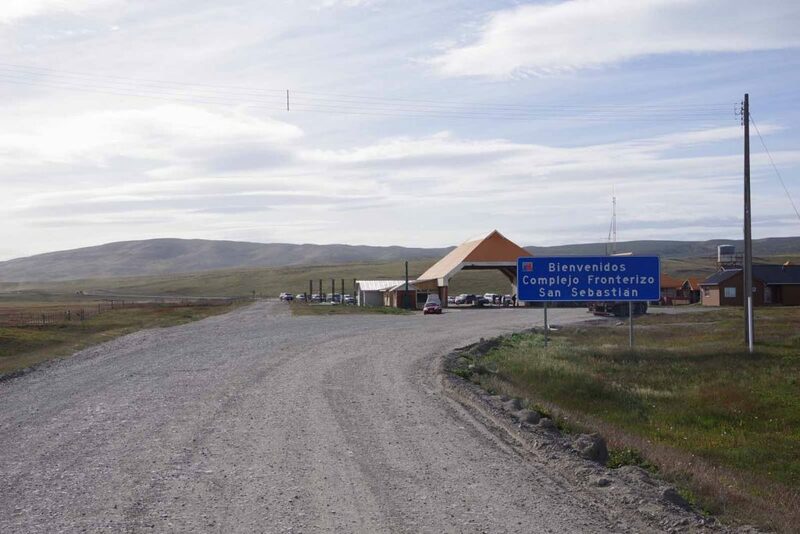 Heading into the Argentian border station. 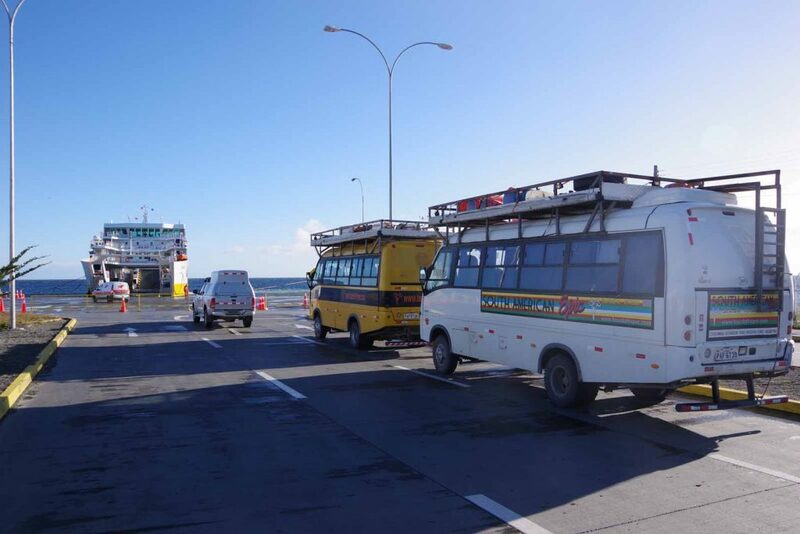 Our bus driver told us he had passengers with bicycles and when it came out that we had bicycled into Argentina, the guard insisted that we also bicycle out of the country. Dean getting ready to ride his bike. 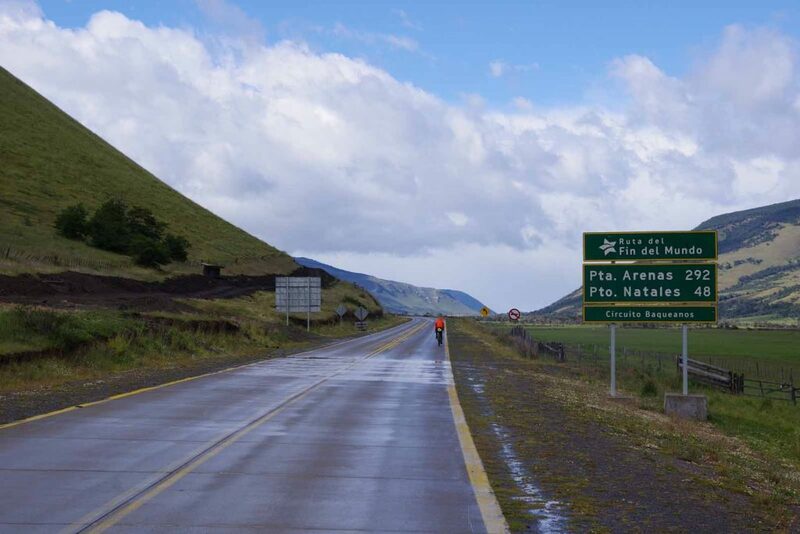 The first 2km were gravel and after that 6.5km of pavement in Chile. Also right as we started riding, the clouds let loose with a lot of rain. This made the Chile border post welcome because it was inside and out of the rain. 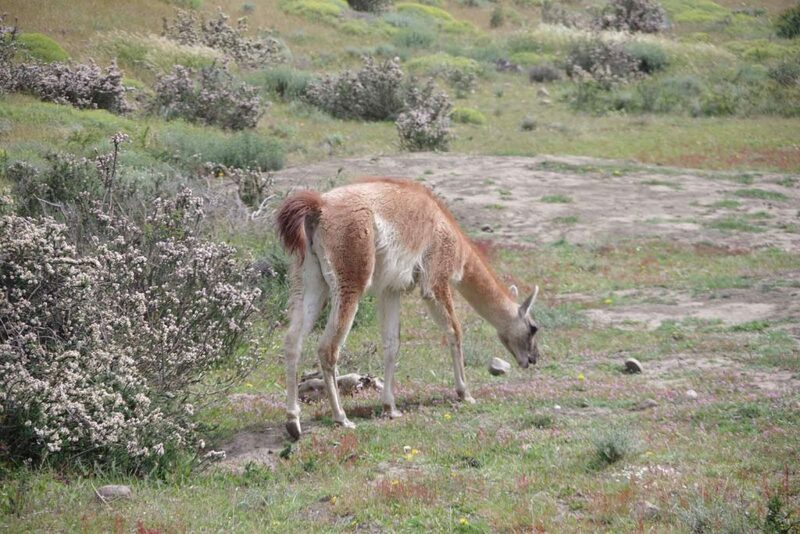 Cycled the last bits to the nearby village of Cerro Castillo where we stayed in “Martha’s backyard”. Not sure how Martha got into this business but she charged groups like TDA to camp in her backyard and then also opened up her house with bathroom and shower. There were also bathrooms next door at the bus station. 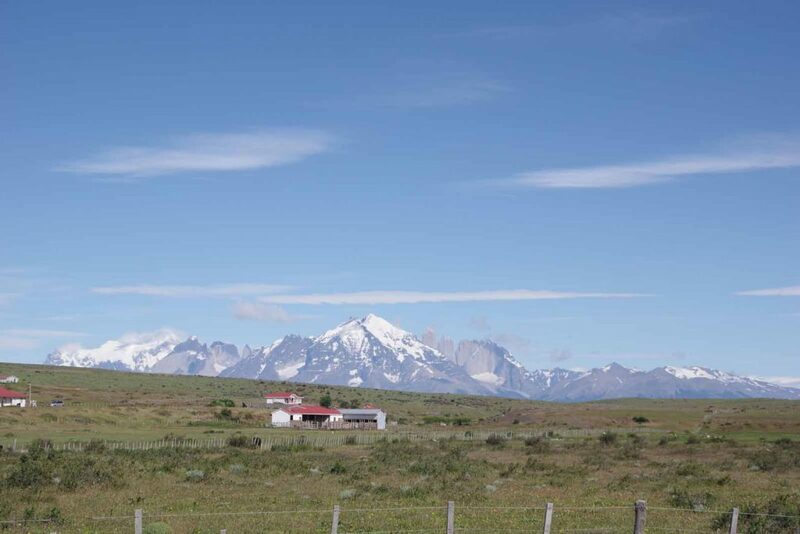 Beautiful clear day cycling to Torres del Paine park. 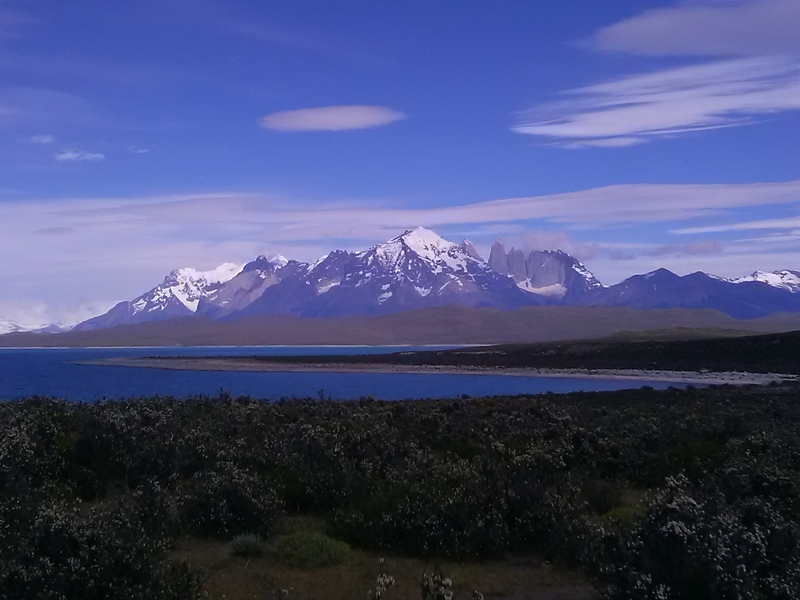 From Cerro Castillo, we went north to the park for a rest day. 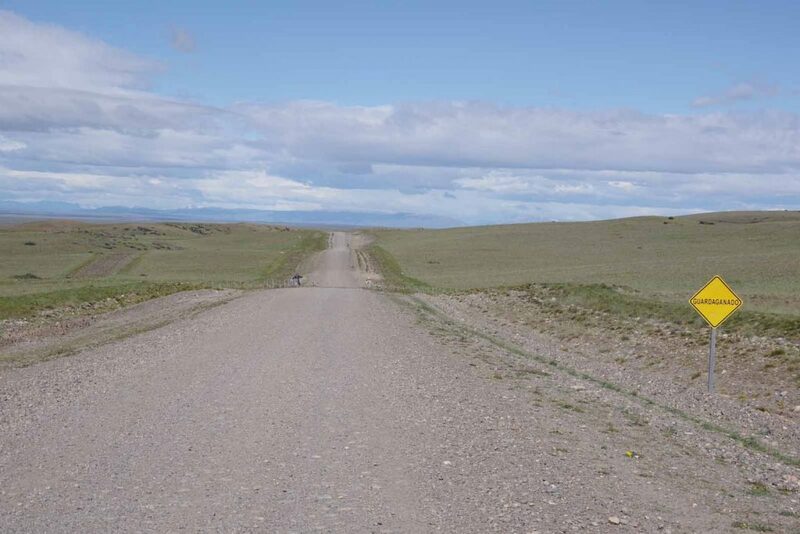 We anticipated ~62km of gravel road and were pleasantly surprised when all but about 20km was paved. It did start with some tough winds and a short steep hill or two. Sign warning us of strong lateral winds crossing a wide open valley. At 30km we rounded a corner and wow! the mountain and towers (to the right) were now visible. For those not paying attention, a photographic zone was coming up in a kilometer. It was a great view with lake and mountains. Zooming in a bit on the towers. Over the next 30km I kept finding new places to take another photo. I found the views stunning to keep rounding bends and hills with mountains in front. These guys were right by the road and not particularly scared or bicycle traffic. Another view from closer up. We reached the main trekking area. The park was expensive both for camping/lodging and for things to buy. TDA did a kind thing by cooking dinner one evening (and negotiating the second one from the park). 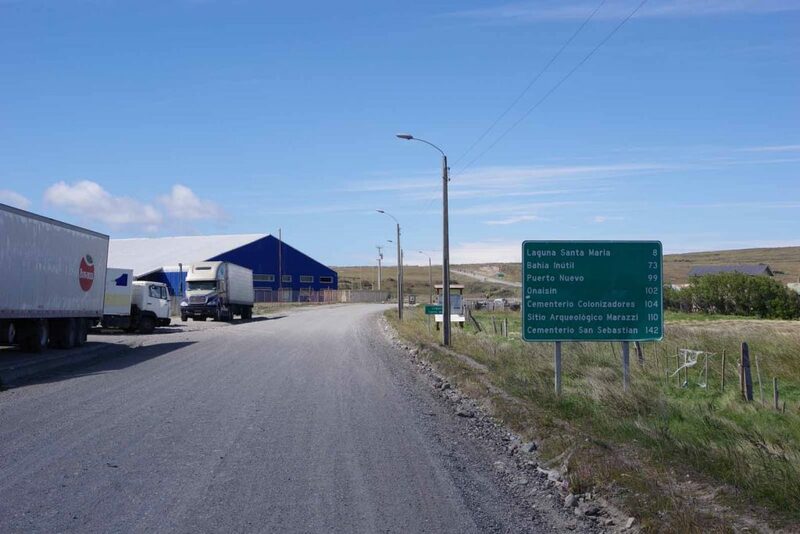 Appreciate this particularly since it also meant an extra run to Puerto Natales to buy groceries. There was also a mixup where the park thought we still had hostel reservations after the cancellation deadline and hence was going to charge for these spots whether used or not. This meant that riders were given a choice of a hostel bed in larger shared room or a camp site with five campsites available. I was one of the five who picked camping. That worked well, though the second night had considerable rain and wind. Some riders had taken bus previous day and done a hike and hence we had reports of the 18km round trip hike to the view area. I was happy to have cycled the previous day even it today we had more stormy weather coming through. It was a nice hike with the last 2km close to the towers tougher scambling. we first went up a ridge and then down into this valley. 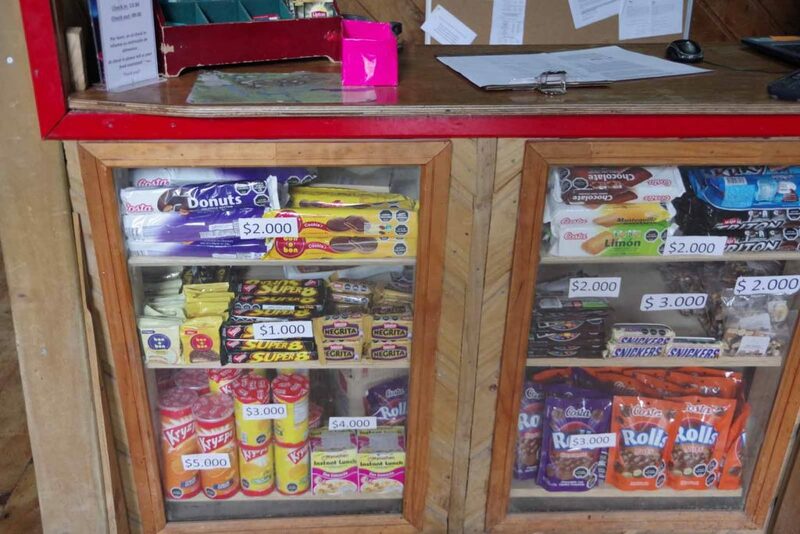 There was a refugio here where one could stay or buy snacks like these. There are ~630 Chilean pesos per dollar, so prices include $7.50 USD for that can of pringles and $4.50 USD for a snickers bar. A can of coke was ~$5.00 USD as well. More hiking along the trail, mostly following the river valley. It was misty and cloudy at the small lake at base of the towers. Obligatory shot with myself and the towers. After this a hike back down. The strong weather system came in in the afternoon and so nice to visit the lodge for a bit. In the evening period of strong winds as well as rain. However, as a whole, I was happy we had visited Torres del Paine and got a chance to see the park, both from cycling to the central area and also from hiking to the base of the towers. Weather forecasts were turning to more rain. 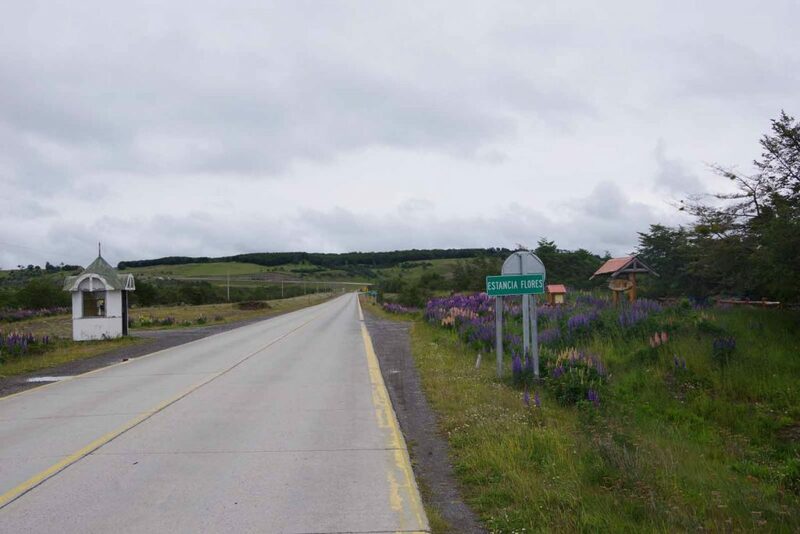 I had already cycled to the park, so decided I would take the bus to lunch and then cycle the new section south to Puerto Natales. Snow just a few hundred meters up the peaks. As I started riding there was a brief, cold rain shower but then it improved as I cycled through this valley. Also had more tailwinds than headwinds. 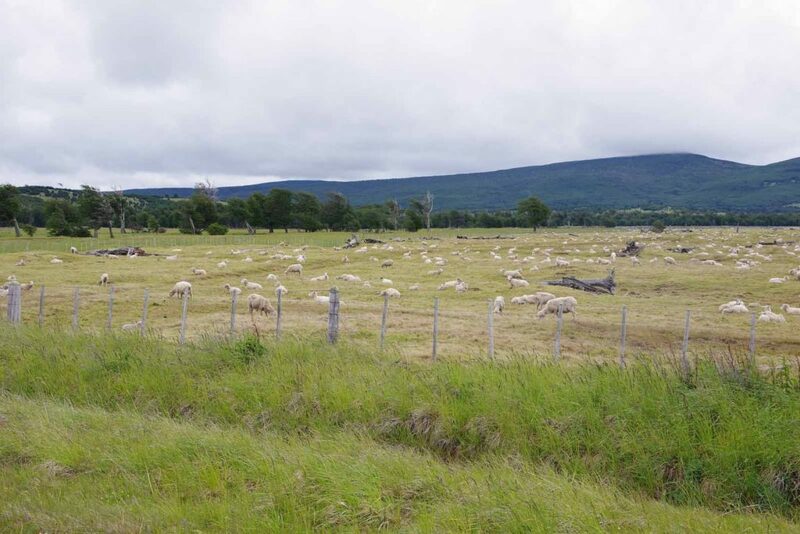 Many fields with sheep along the way. I could “baa baa” at then and often get some to “baa” in return. 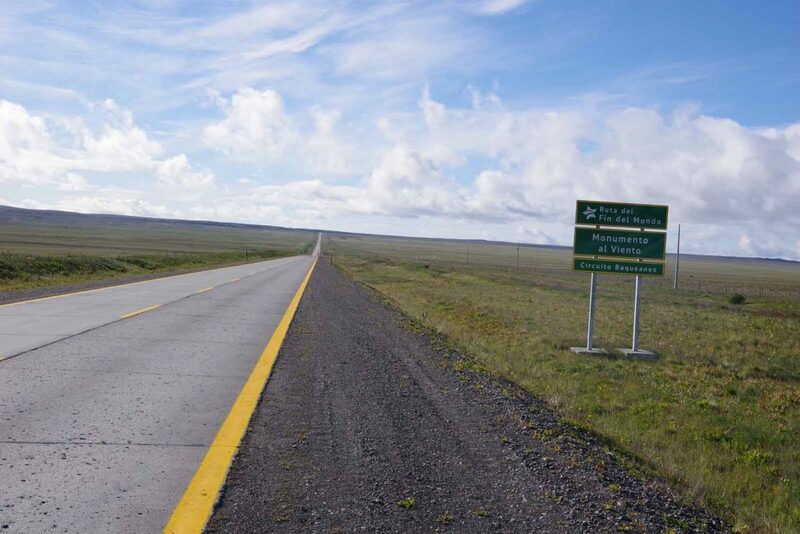 The highway is marked as “fin del mundo” going to the end of the world. 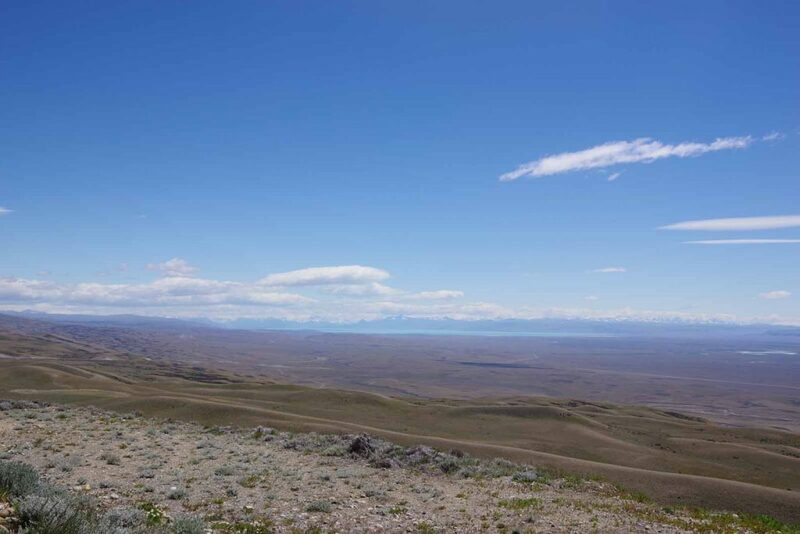 Puerto Natales in the distance. A small town with touristy areas. We had rain showers off and on through the day and overnight and were happy that the accommodation was in cabanas this evening. One of the coldest days cycling yet, particularly 75km of riding in the rain at temperatures of ~2C (35F). 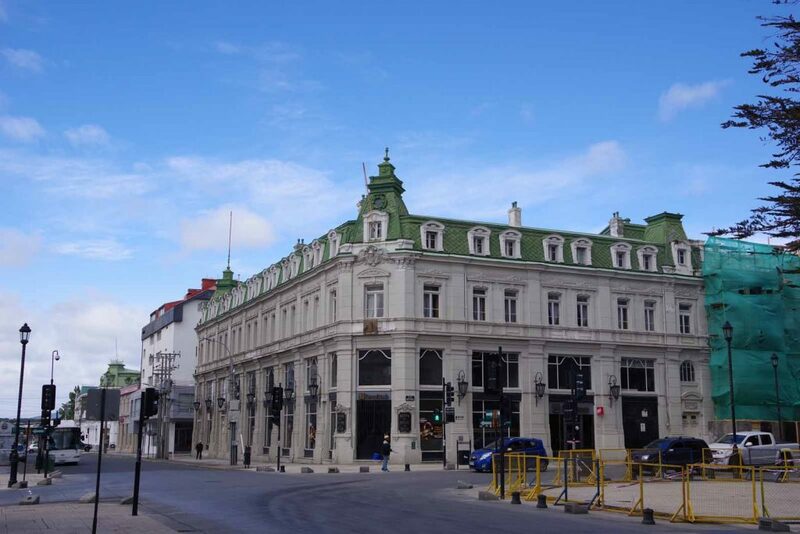 Five riders had already seen the weather forecasts, the tourist attractions in Punta Arenas and decided to skip ahead on the bus to take some extra days in Punta Arenas. I decided to cycle the 148km day and see how it turned out (it turned out cold). 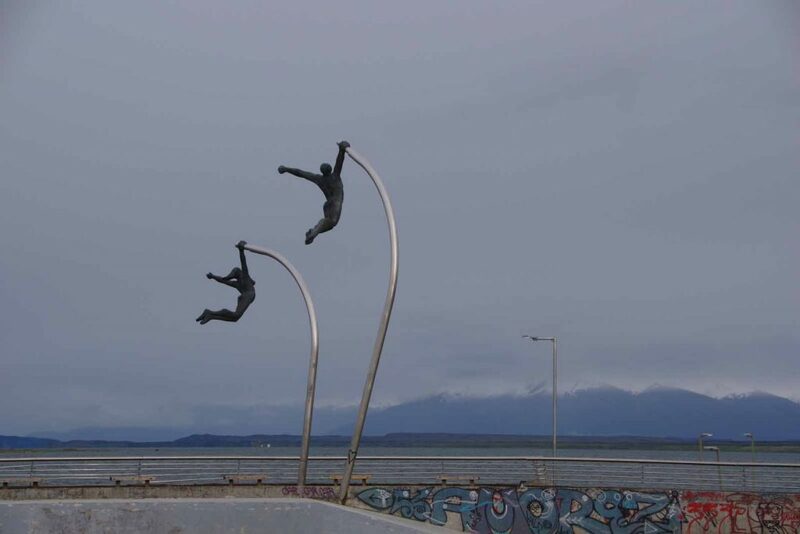 A fun sculpture in downtown Puerto Natales. Memorial with a lot of donated water. 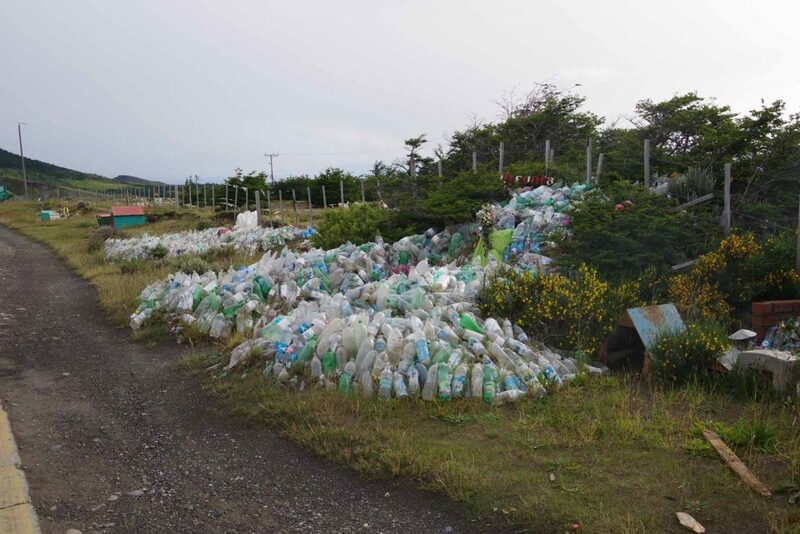 We passed an area with many of these estancias. Sometimes they would have small bus shelters. Crossing the province boundary. Also last picture I took today before going into “heads down” mode in the cold and rain. While it was cold, my core body kept warm with only three layers. My hands and feet were cold but otherwise, as long as I concentrated on riding I could keep warm enough. Just one of those afternoons to grind out some distance. 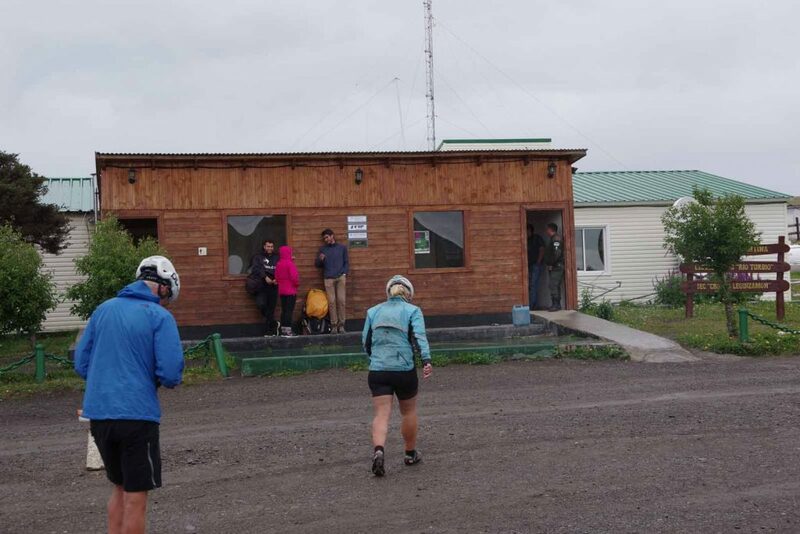 On arrival in camp, I put on an extra rain pants and two layers of clothing up top. Somehow felt a bunch colder and shivering for a bit. Went to a cafe inside, ate a good hearty TDA dinner and retired early to my tent. We were also fortunate that our tent camping was underneath an cover at the rodeo grounds. 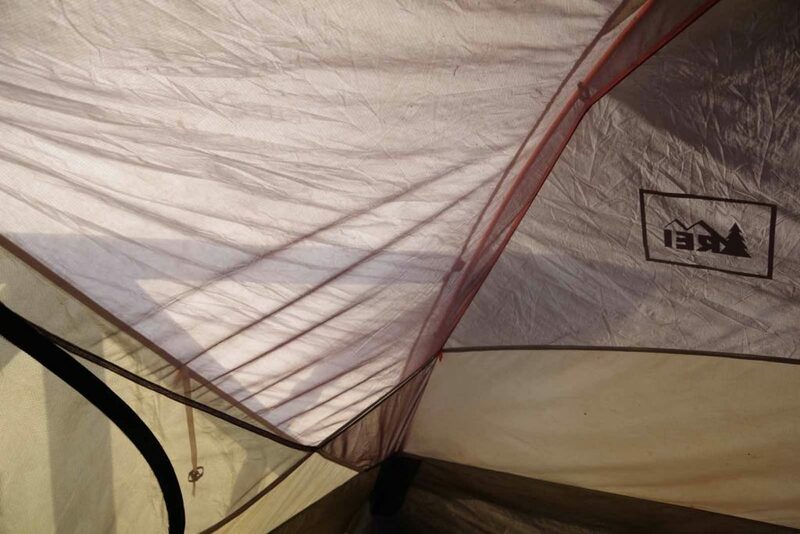 Sunshine on the tent in the morning! Hooray! A cool morning starting out, but the sun gave a big boost. This Swiss cyclist (with journal in German). Was also in town last night. 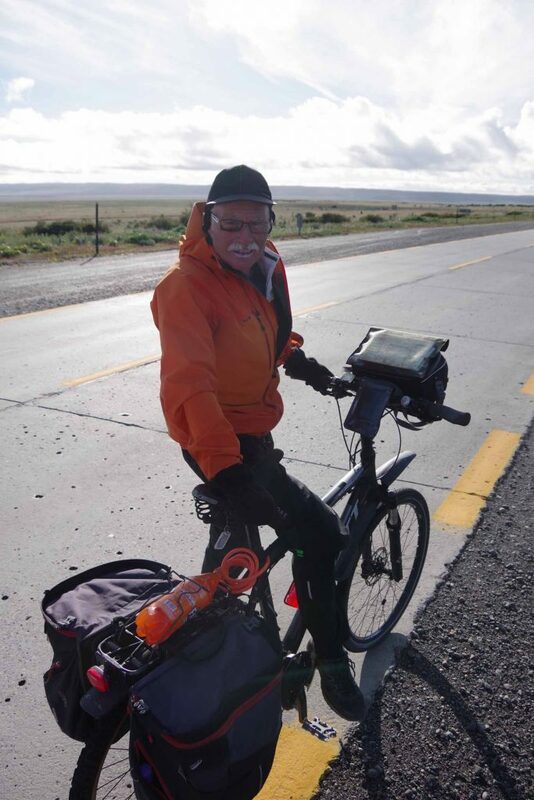 Interesting on two accounts: he is in his mid-seventies and started bicycle touring after he retired. 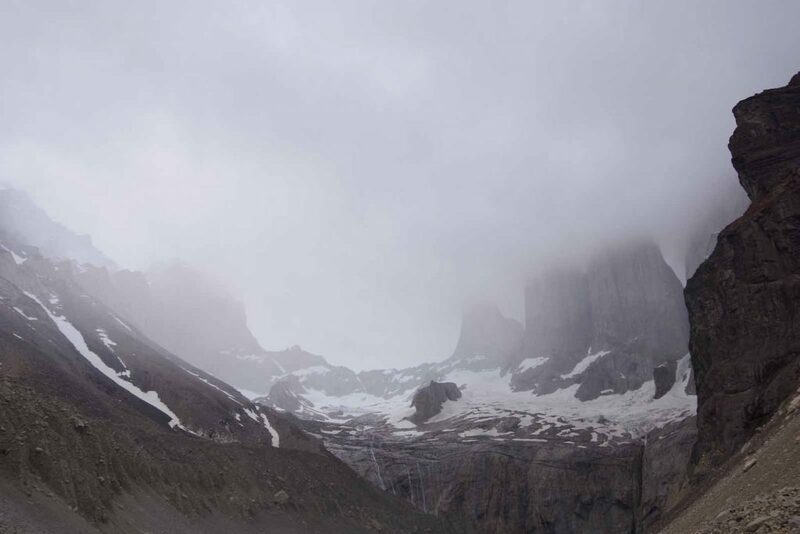 Also, his tent and some gear was stolen in northern Chile so he continued without a tent and somehow had been able to find places to stay. Along the way was a monument to the wind. Mike and Nola cycle past the monument, several strange shaped metal contraptions on poles. At 50km was a road junction. Traffic was already busy but after this point became even busier. What also made things more difficult was a strong cross-wind and a road that was narrow. Lunch was here along the road. 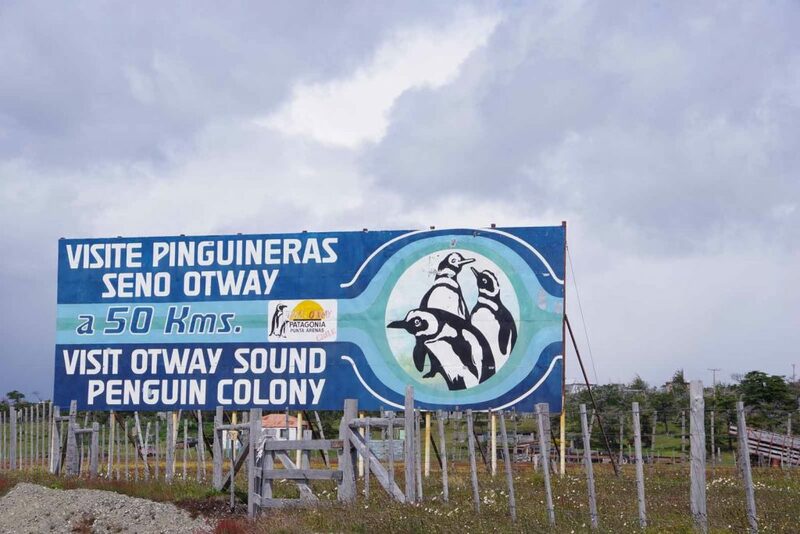 I saw signs for those penguins that others might have gone to visit. Coming into town, signs of a harbor town. Have only walked around a little but nice to be in a larger town again. A good chance to rest here and get ready for our riding to Ushuaia. 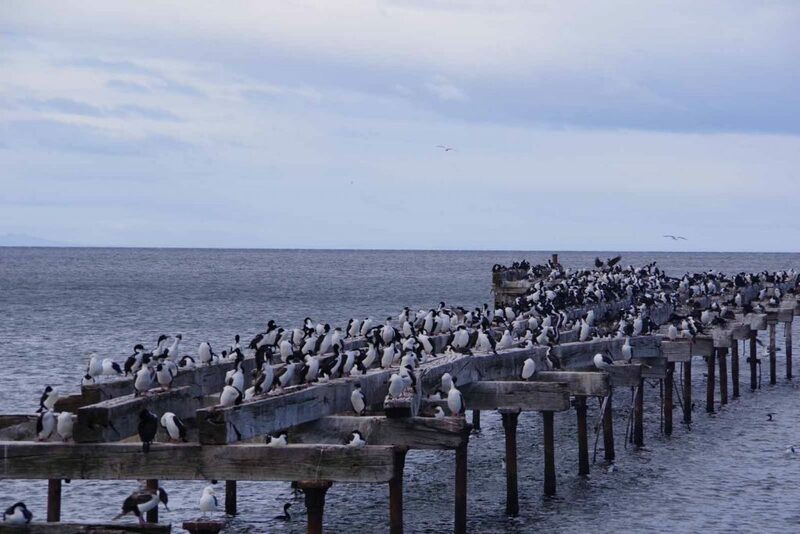 Punta Arenas is on the Straights of Magellan where one can sail around south America. On other side of this bay is a large island area of Tierra del Fiego. 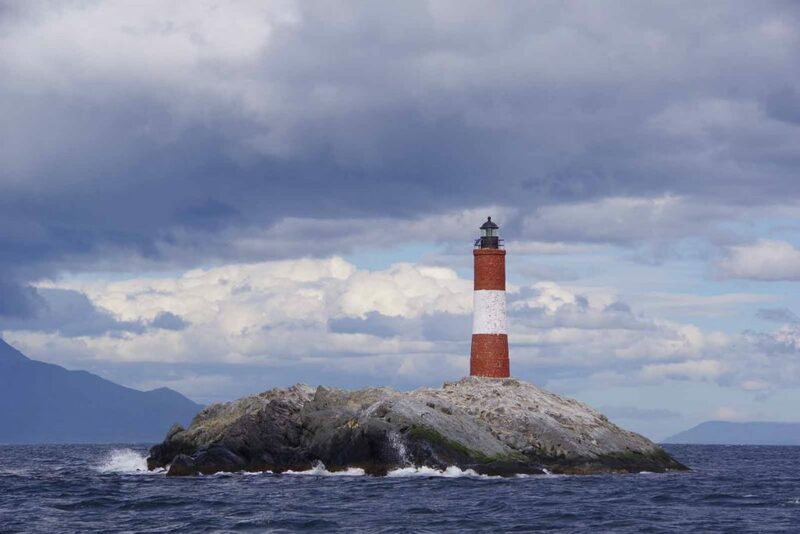 The largest island (Island Grande) is where we will ride across for four days to reach the Beagle Channel and town of Ushuaia on south side of the channel. 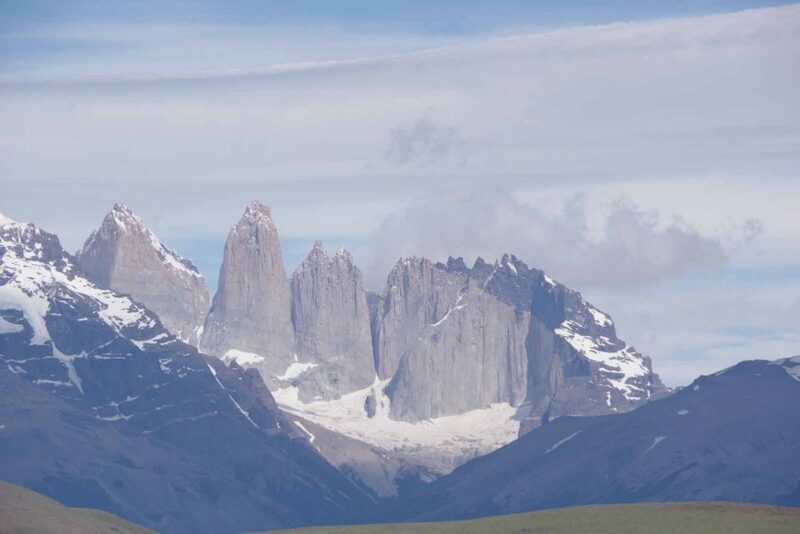 Rest day today in Torres del Paine. 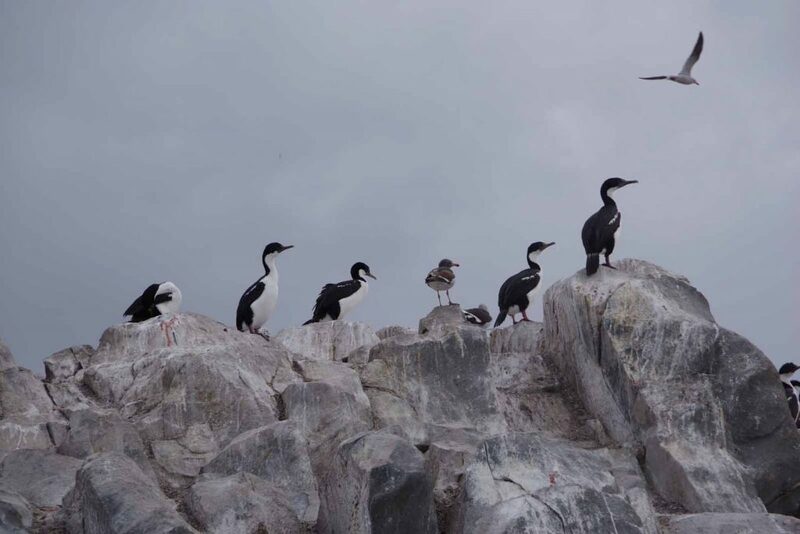 Everything including internet is expensive, so try a quick update and wait with a more complete photo collection from Punta Arenas or even Ushuaia. Today I saw a coke for $5 a can and felt fortunate I had only paid $2.50. Yesterday was a great ride to reach the park. We expected gravel, but it was mostly paved. Halfway we started to see views of the mountains including the towers (torres). I must have gotten 15 different photos because each time it seemed even more stunning. 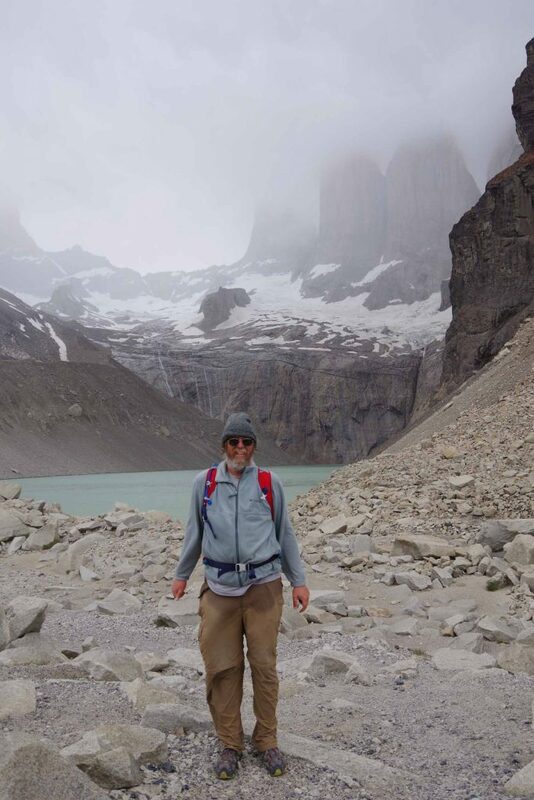 Today I hiked up to lake at base of the towers. A weather system was coming through, so misty clouds and couldn’t quite see all the towers. Adds to the mystique though. I’m camped in my tent. Most others are in shared hostel accommodations (there was a mix-up and a very long cancellation policy – we were given a choice and I was one of those opting for my tent rather than crowded together in a room). The wind and rain has come through some this afternoon. My tent does fine with the rain, though at a particular angle the strong winds almost fold the tent flat. 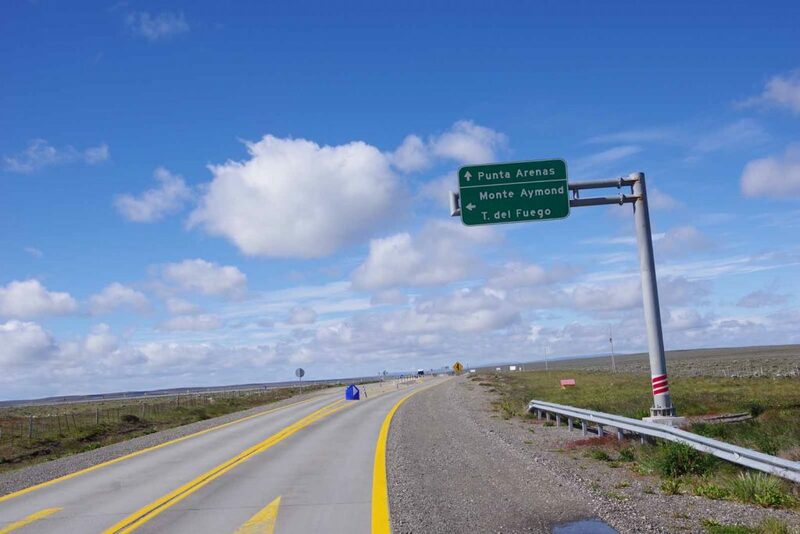 Schedule has been posted, we’ll have three days totalling 370km to Punta Arenas where we have another rest day. 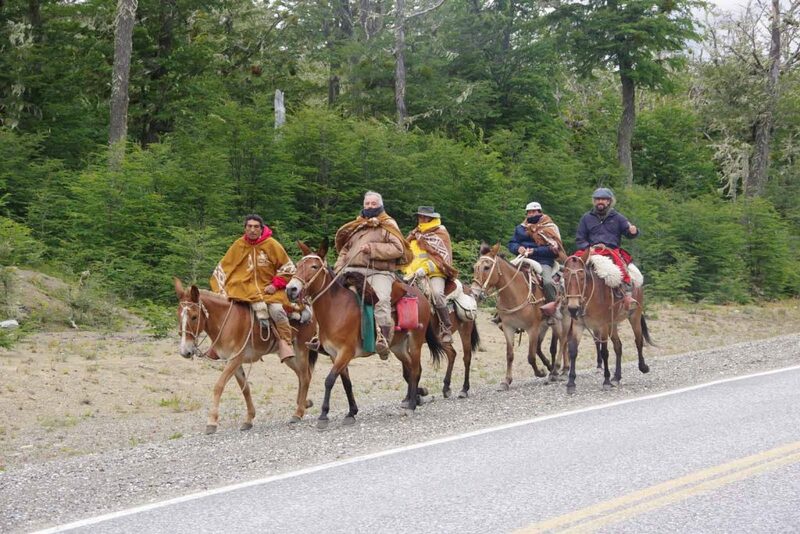 After that four days riding to Ushuaia. Some on the trip have “end game fever”. I expect some tough riding still, so focus on that first. 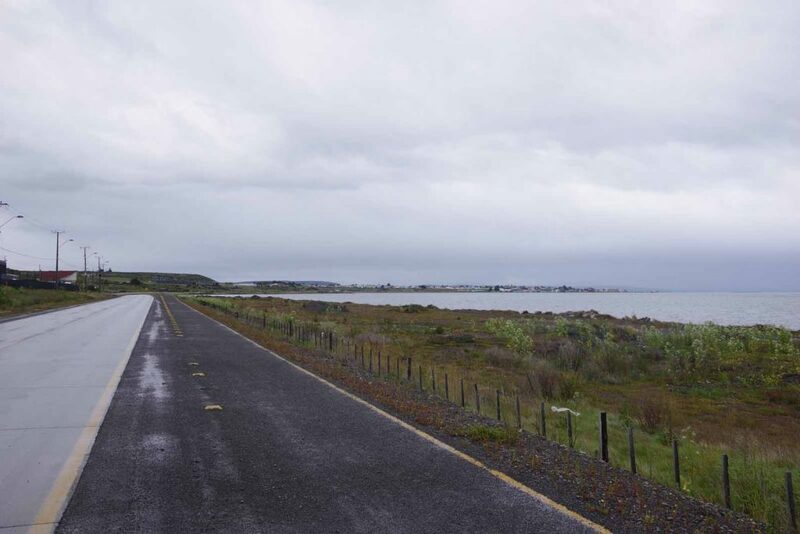 Our day from O’Higgins and some of the volatile weather here make me happy to be on a supported ride, even if I took the bus once or twice on the longest days. 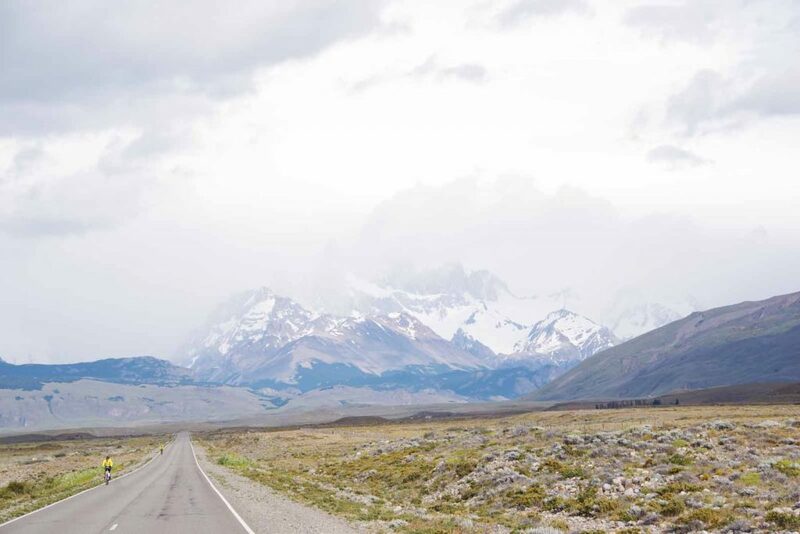 Still like getting out and riding what I can and enjoying this southern part of Chile and Argentina.